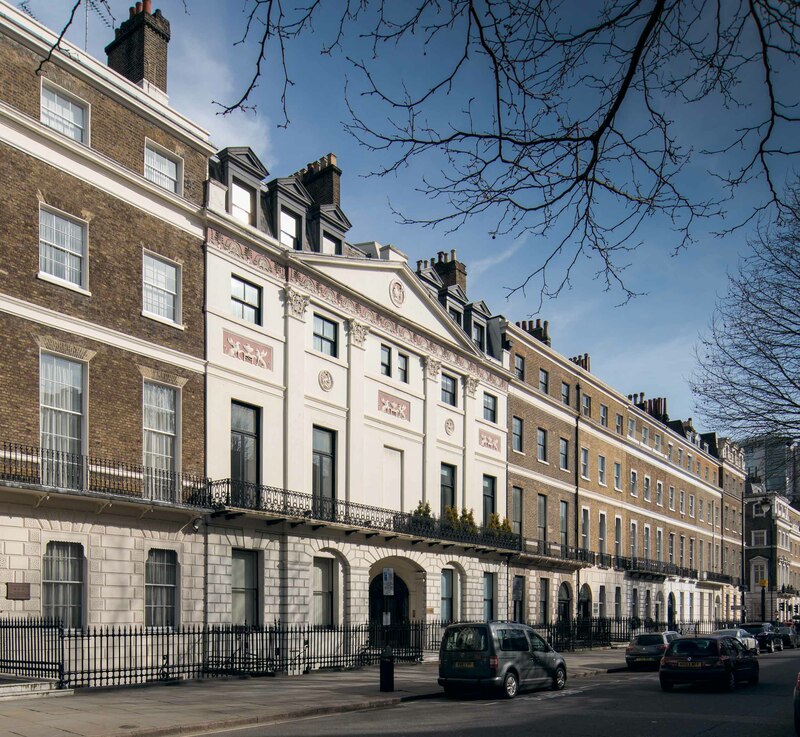 The Adam brothers’ celebrated street improvements at Mansfield Street and Portland Place, carried out from the 1760s on the Marylebone estate of the Dukes of Portland, are among the many significant buildings covered by the Survey of London’s forthcoming volumes on South-East Marylebone. 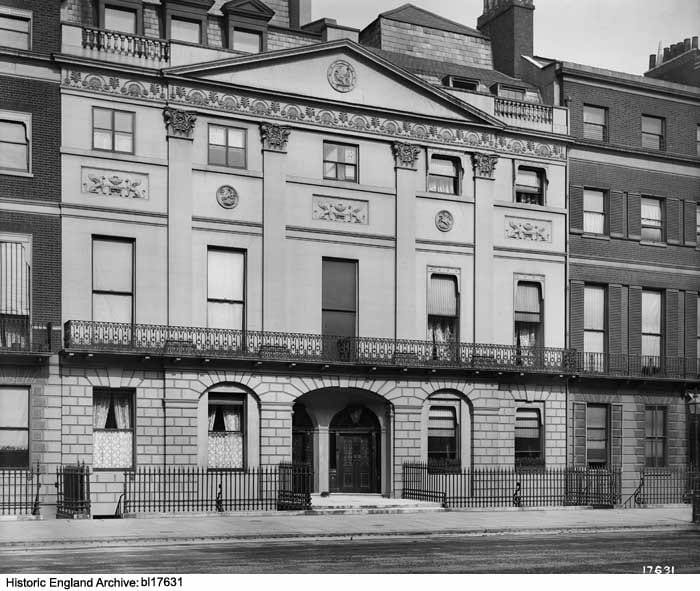 Less well-known, however, is the detached mansion that Robert Adam designed around 1770–2 as a new London residence for the 3rd Duke, to stand on a large site on New Cavendish Street, looking down Mansfield Street. Though it was never built, its story can be pieced together from designs in the collection of Adam office drawings at Sir John Soane’s Museum – the principal resource today for anyone wishing to study the work of the Adam brothers. 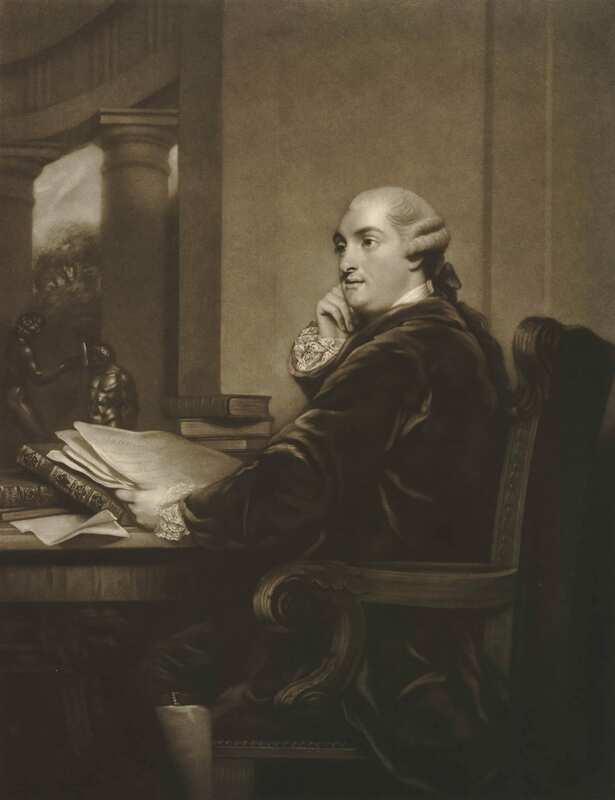 William Henry Cavendish Cavendish-Bentinck, 3rd Duke of Portland (1738–1809), had recently married Lady Dorothy Cavendish, daughter of the 4th Duke of Devonshire, and was already embarked upon a career as a statesman that would see him appointed 1st Lord of the Treasury (the equivalent of today’s prime minister) on two occasions, in 1783 and 1807–9. 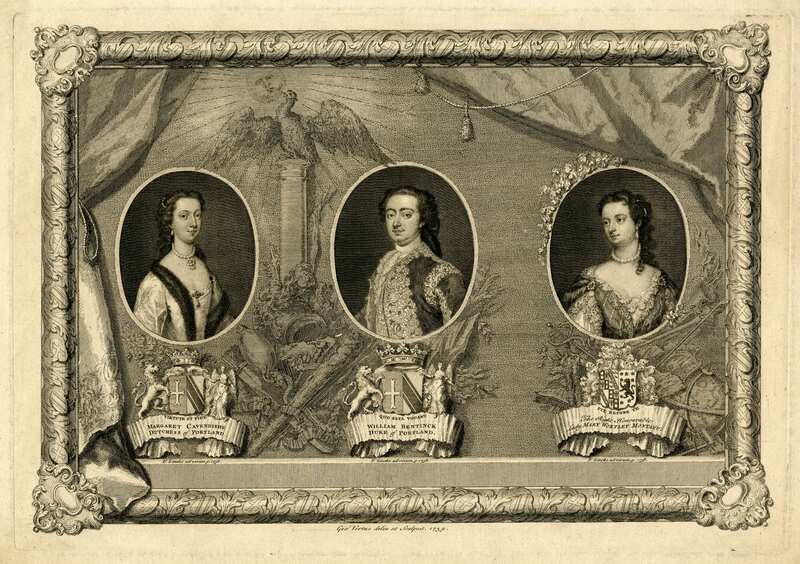 But although he had succeeded to his father’s title in 1762, the 3rd Duke did not immediately inherit all his estates. By the terms of his father’s and grandmother’s wills, the Duke’s mother, Lady Margaret Cavendish-Harley Bentinck, the Dowager Duchess (1715–85), retained a life interest in the family’s lucrative Cavendish lands, and she also held on to her husband’s house in Whitehall – leaving her son short of funds and without a London residence. The situation was exacerbated by strained relations between the two. They argued over country seats, in the end engineering a ‘house swap’ (she favoured Bulstrode in Buckinghamshire, he preferred Welbeck, Nottinghamshire), and failed to see eye to eye on politics as well as family finances. The Duke was a Rockingham Whig, intent on curbing what he perceived to be an increase in royal powers under George III; she numbered the king and queen among her friends, and was especially close to John Stuart, 3rd Earl of Bute, the royal favourite and prime minister in 1762–3, a man whom her son vehemently distrusted. The Duke complained to anyone who would listen that he was required to pay rent for a London house when he should have had access to the ducal residence in Whitehall. 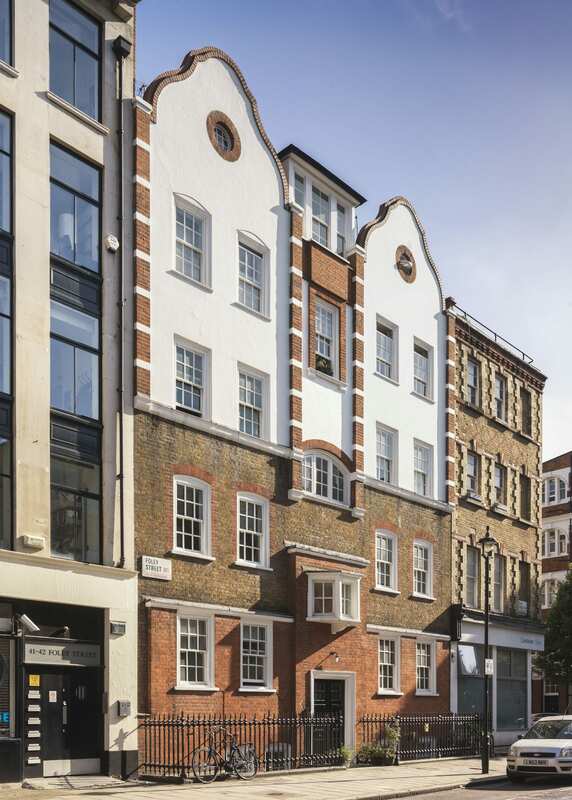 And so a new, Adam-designed townhouse at the head of Mansfield Street would suit his intended station as a leading politician and also act as a focus for his fast-improving Marylebone estate. In its size and scale the house that Adam designed, intended to be known as Portland House, was more like a country pile than a townhouse. In this and in certain elements of its internal planning it shared similarities with Lansdowne House, Adam’s first big private London commission, designed initially for Lord Bute but finished after his fall from favour in 1763 for his rival, another future prime minister, William Petty Fitzmaurice (1737–1805), 2nd Earl of Shelburne, later Marquess of Lansdowne. 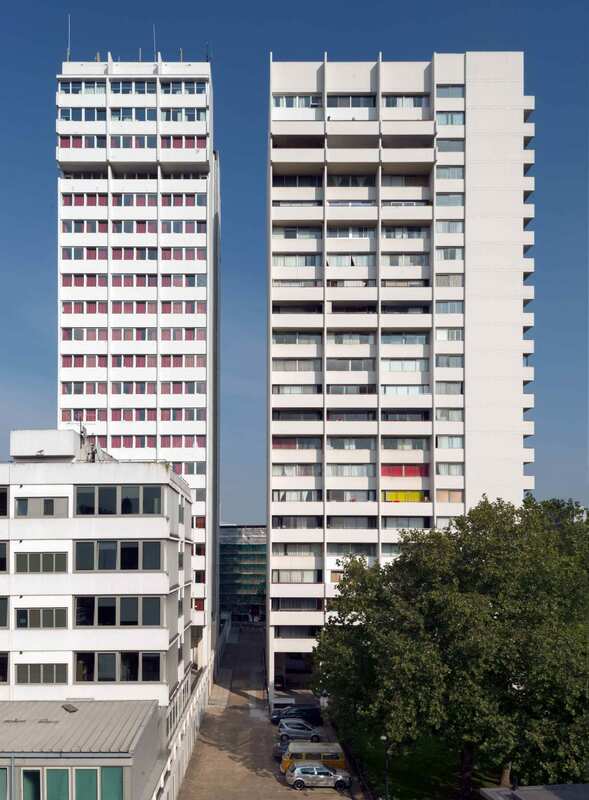 Adam’s designs for Portland House were for a rectangular, two-storey block set within extensive grounds, with a garden to the rear and an entrance courtyard in front. The house itself would have been a fairly standard neo-Palladian affair, with seven central bays recessed behind projecting three-bay end wings. The entrance front was marked by a central portico with columns of what look like Adam’s favourite ‘Spalatro’ order – an invention of his own, based on a late-Roman capital he had seen in the Peristyle of the Emperor Diocletian’s Palace at Spalato on the Dalmatian coast (now Split, Croatia). Portland House was to have had a lower ground floor given over mostly to servants’ rooms and storage, but with a gentleman’s library in a bowed room at the rear, and a bedchamber for the Duke and ‘Book room’ alongside. The principal state rooms were placed centrally on the floor above, with dressing rooms for the Duke and Duchess to either side. These connected with the little single-storey bays shown in shadow at each side of the mansion in the elevation, where there were to be powdering and retiring rooms, privies and water closets. There would have been further rooms on the first floor and in an attic within the hipped roof. One of a pair of Adam office plans shows a proposed design for the house’s lower ground floor, with a rectangular courtyard in front, lined with coach-houses and stables on one side, kitchens, sculleries and more service buildings on the other. This plan matches the elevation, and shows how the portico served as a porte-cochère, with a curved ramp for coaches leading up to the main entrance. Also, in this plan an entrance screen wall and gateway is set quite a way back from the road, with more stabling and coach-houses in front. 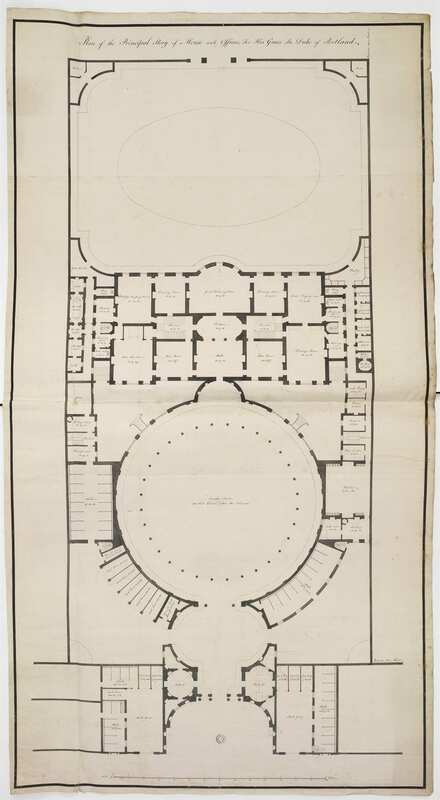 A first-floor plan offers an alternative arrangement, for a far more dramatic circular courtyard, surrounded by a roofed and colonnaded walkway. An accompanying section shows how this colonnade connected directly to the house, dispensing with the portico. This arrangement required further alterations to the design of the house, with windows at a higher level on the piano nobile, to allow light to enter the main rooms above the courtyard structure. Apparently this was the design chosen by the Duke. The Adams had been experimenting with colonnaded courtyards in house designs since the 1750s. 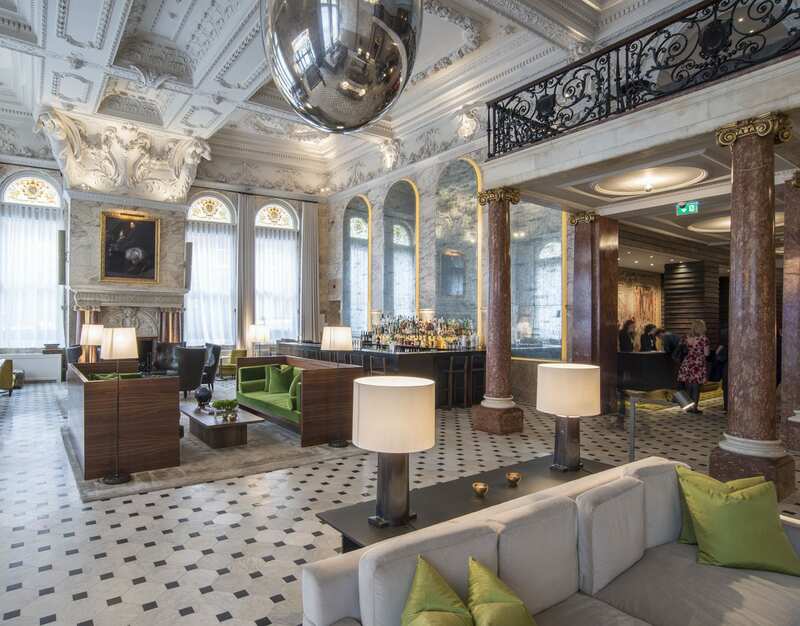 Although their prime inspiration was always Italy, and in particular ancient Rome, there is a heavy debt to French plan-types, particularly Parisian hôtels, in their mansion schemes of the early 1760s. 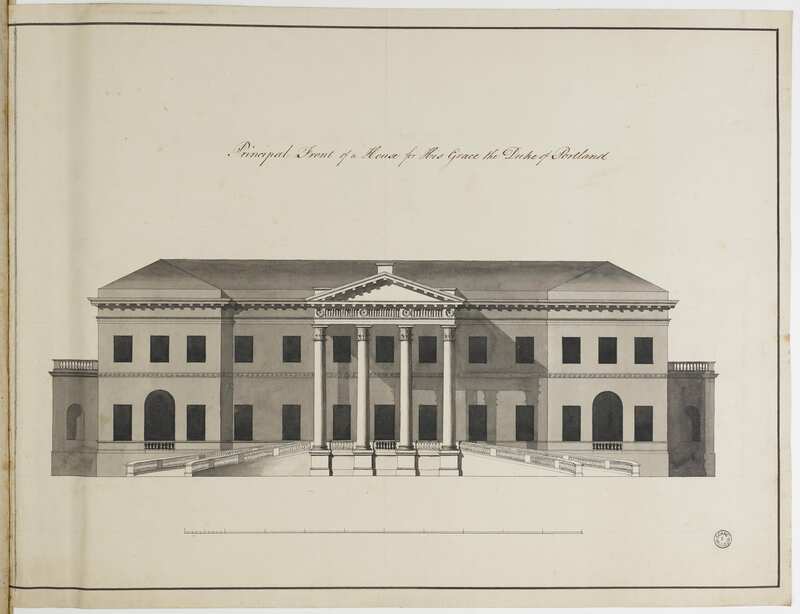 An unexecuted house of c.1764, intended for Lord Shelburne near Hyde Park Corner, was set behind a large front court, as was another design of the same date for a house for Lord Holland at The Albany, Piccadilly. Also, an early Adam brothers’ plan of around 1767 for the house they built for General Robert Clerk at the south end of Mansfield Street, facing Duchess Street, had the lower part of the house arranged in a curve and fronted by a semicircle of columns forming a carriage-way, in a similar manner to Portland House. Other surviving drawings include an office elevation of a screen wall and gateway to stand on New Cavendish Street in front of the courtyard, in the form of a triumphal arch, closing the vista up Mansfield Street. 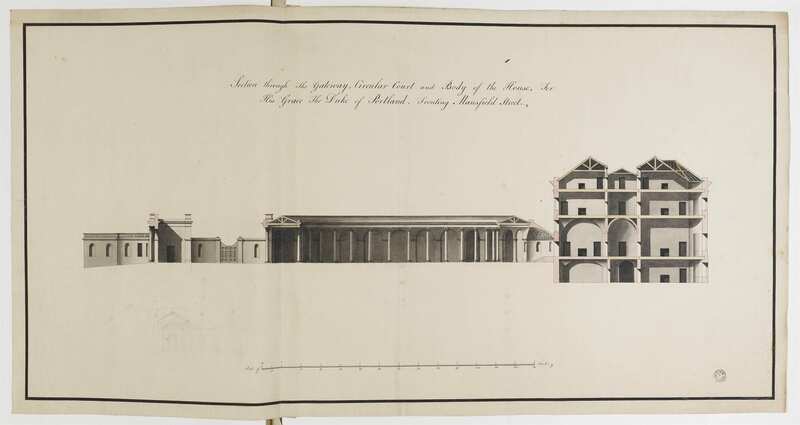 A second version, in pen and pencil, apparently in Robert Adam’s own hand, has detailed measurements added to it, in preparation for drawing up estimates. 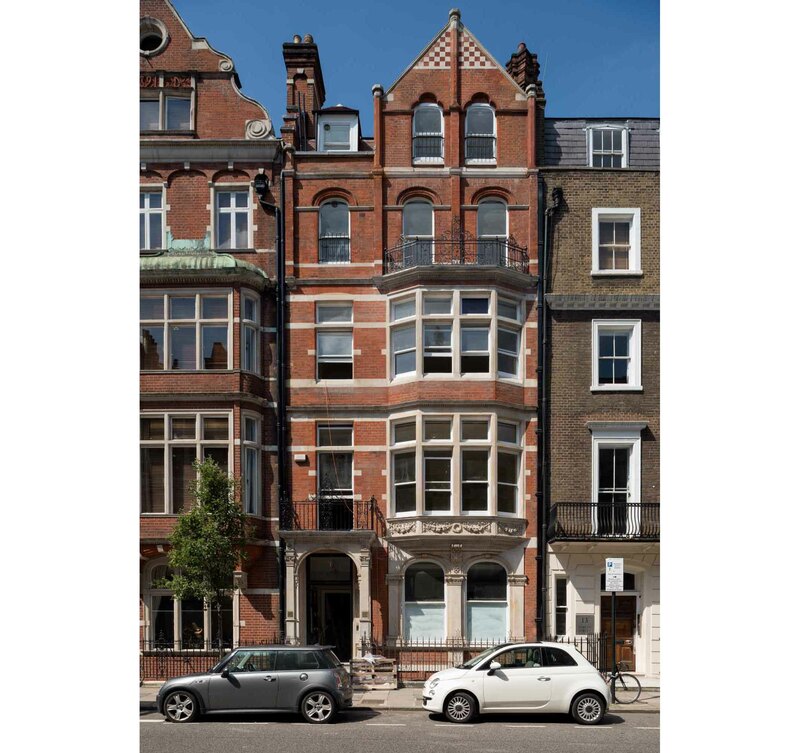 But within a year the project had been dropped and the Duke was happy to let part of the site to the builder–developer John White for houses on the east side of Harley Street. The ground fronting New Cavendish Street was then leased by the Duke and the Adams to the architect-builder John Johnson, who erected the present Nos 61–63 there in 1775–6 (these will be the subject of a future blog post). For a time around 1773–4 the Adams seem to have considered re-siting their ‘hotel’ for the Duke of Portland to the west side of Portland Place, where they had been planning at least two other very large aristocratic houses, for the Dukes of Kerry and Findlater, but this plan also failed to materialize, and the Duke of Portland when in London continued to live mostly at Burlington House, courtesy of the Duke of Devonshire. 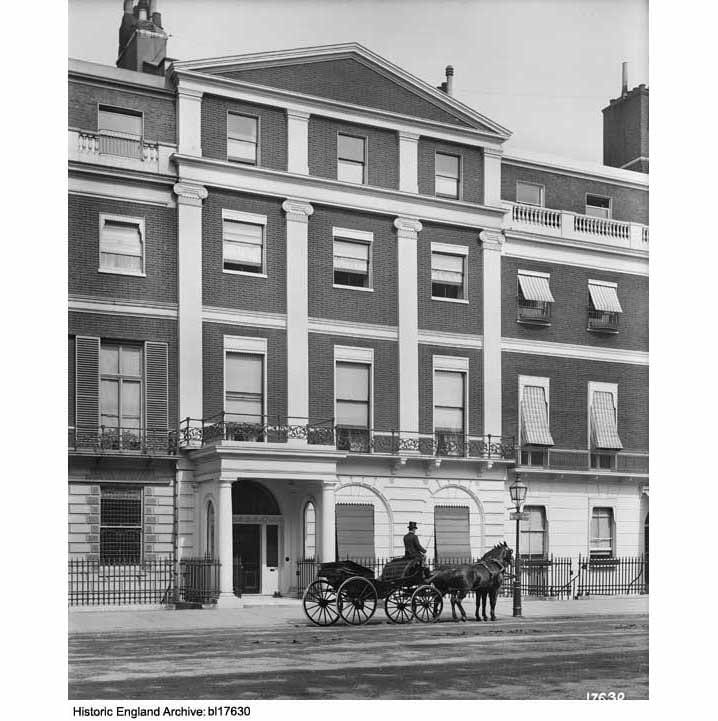 In 1807, when he was made 1st Lord of the Treasury for the second time, the Duke moved to 10 Downing Street, which was then as now the official residence of the 1st Lord of the Treasury (not the prime minister, though in modern times the same person has usually occupied both posts). The Adams must have remained on reasonably friendly terms with the Duke, as they were allowed to continue to work on Portland Place, even though its completion was delayed until the 1790s by unfavourable economic conditions and the Adam brothers’ own financial problems; by then both Robert and James Adam were dead. Their cause may have been aided by the Duke’s friendship with their nephew, the Rt Hon William Adam of Blair Adam, the son of Robert and James’s older brother John Adam. A lawyer and advocate by training, and later a judge, he was one of the 3rd Duke’s great allies in the Whig party when it came to boosting party morale and raising funds in preparations for the general election of 1790. Special thanks are due to Dr Frances Sands, Curator of Drawings at Sir John Soane’s Museum, for supplying the images of the Adam designs for the Duke of Portland’s house; these are reproduced here by courtesy of the Trustees of the Soane Museum. The catalogue entries for these drawings in the Adam office collection at the Soane can be found by following this link. A discussion of the designs also features in Fran’s book Robert Adam’s London, published to accompany the exhibition of that name recently held at the museum. See here for further details. The present synagogue was built to designs by C. Edmund Wilford & Sons in 1956–8, replacing its bomb-damaged predecessor of 1869–70. Jewish West Enders were obliged until well into the nineteenth century to attend long-established places of worship in the City of London, notably the Great Synagogue in Duke’s Place, Aldgate. In 1842 the Reform congregation broke this tradition with a modest synagogue in Burton Street, Bloomsbury, moving to Margaret Street in 1849. 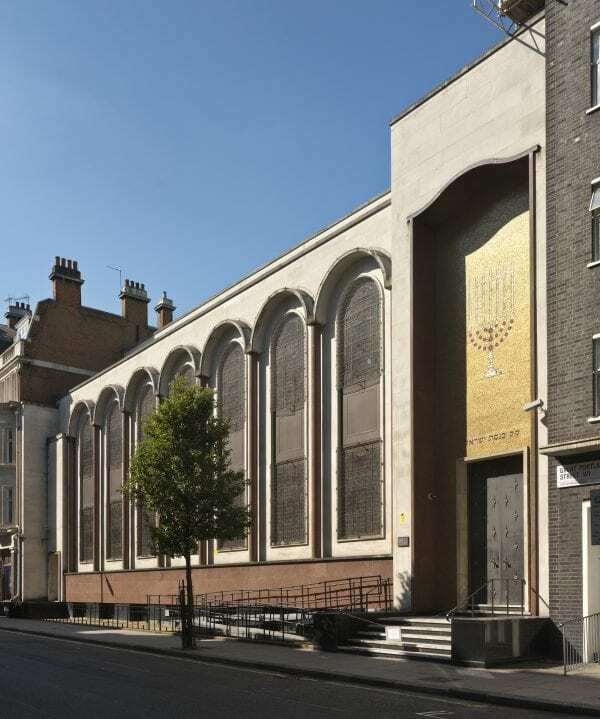 Fearing loss of worshippers to this convenient address, the Committee of the Great Synagogue agreed in 1850 to fund a new branch synagogue in the West End. 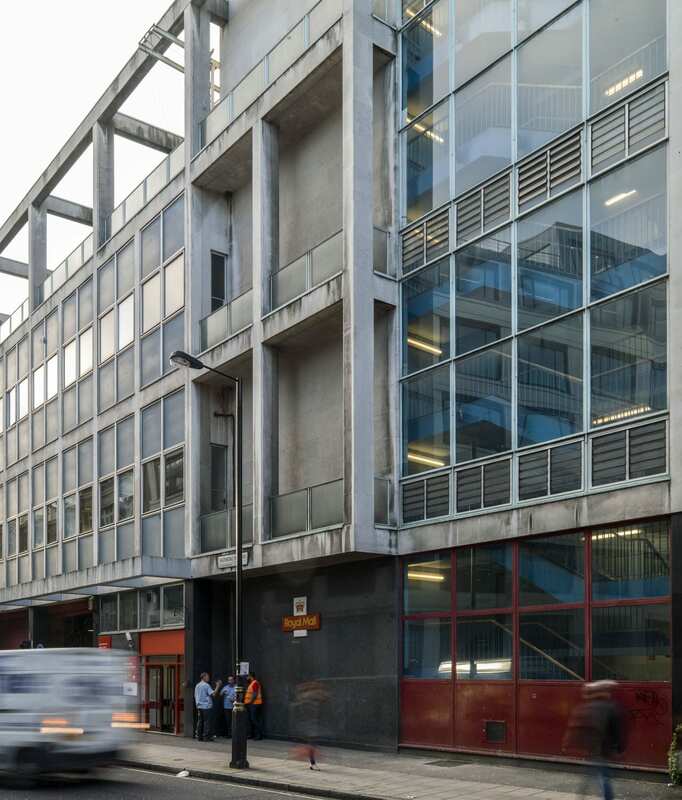 The site selected lay behind 43–47 Great Portland Street, but the building there soon proved too small and could not be extended. In 1866 a Great Synagogue subcommittee headed by Sir Anthony de Rothschild was appointed to find a new site near by and build afresh for 800 worshippers, with two ministers’ houses attached. 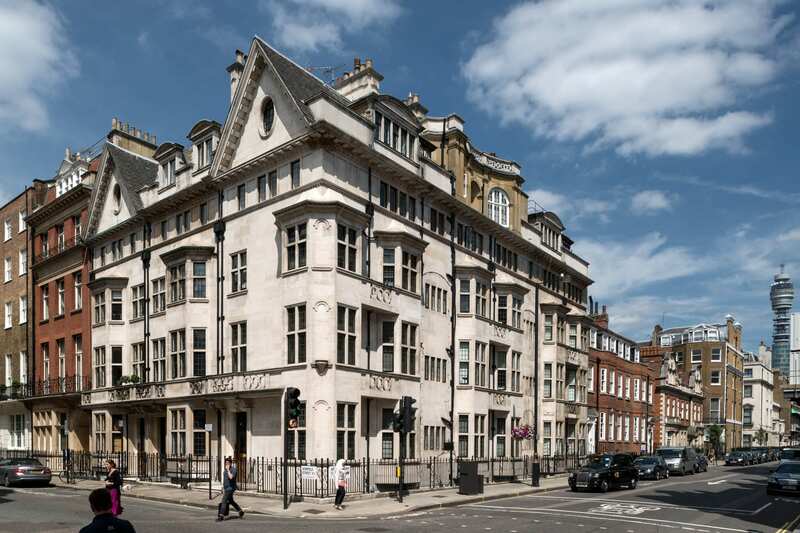 They promptly secured the houses at 133–141 Great Portland Street. The budget was ample, as the synagogue was prospering; Messrs Rothschild had promised £4,000. The committee decided against a competition and chose as architect Nathan Solomon Joseph, son-in-law to Nathan Marcus Adler, Chief Rabbi and creator of the United Synagogue, the federation to which the Central, as the congregation was by now called, adhered from 1870. Joseph presented a Moorish design in 1867, arguing that Gothic and Classical styles were both unsuitable, whereas the Moresque was well adapted to an ‘ecclesiastical’ building yet had advantages of ‘elasticity’ and economy. He was asked to present an alternative Italianate version, but the original was preferred, with modifications. That design was built in 1869–70. 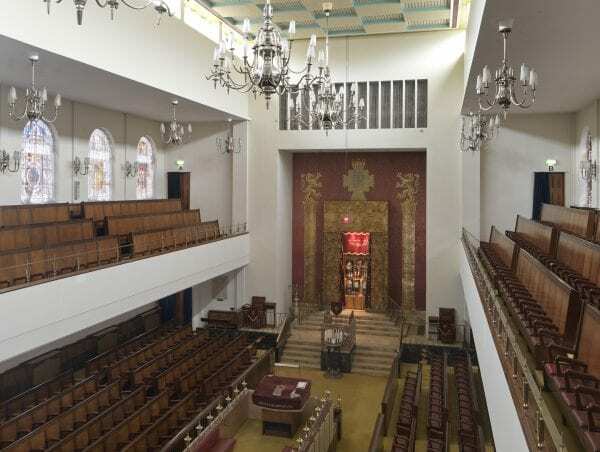 The Central has been described as the first thoroughly Oriental-style synagogue, not just in Britain but beyond. 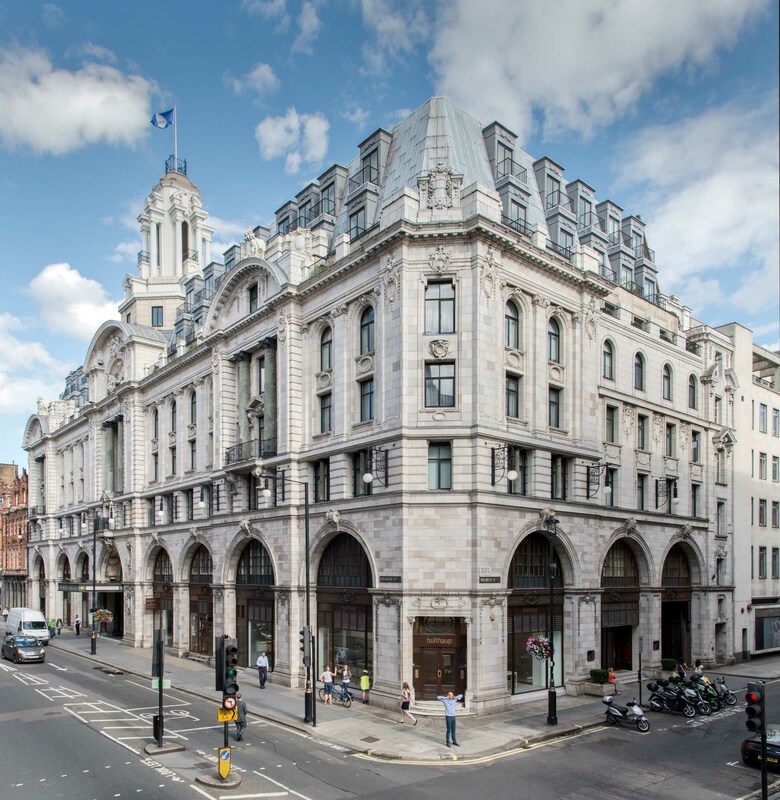 The Great Portland Street front was an eccentric confection in brick and two types of stone, culminating at the north end in a tower-like feature over an entrance porch with a horseshoe arch. The interior, spacious, high and light, faced south like the present building, culminating in a richly decorated apsidal space for the ark. Windows and arches were round-headed, with an orientalizing horseshoe profile above the arches over the galleries, and round clerestory lights incorporating Star-of-David tracery. Cast-iron columns, painted at first, marble-clad from 1876, carried the galleries and roof, which was divided by ribs. The rabbis’ houses at the back along Hallam Street (Nos 36–40) survive, their two-tone brickwork and Moorish detail having a hint of the Great Mosque at Cordoba. 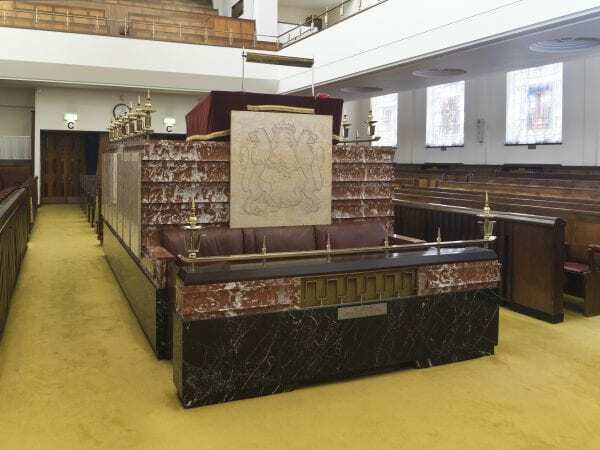 Embellishments took place over the years, the grandest being the replacement of the central almemar with an elaborate new one in marble, presented in 1928 by the 2nd Lord Bearsted in memory of his parents; Joseph’s original almemar (or bimah) was relegated to the Margate synagogue. But the building was burnt out by a fire bomb on 10 May 1941, the congregation returning to a temporary building on the site in 1948. Meanwhile plans for a full rebuilding were hatching. 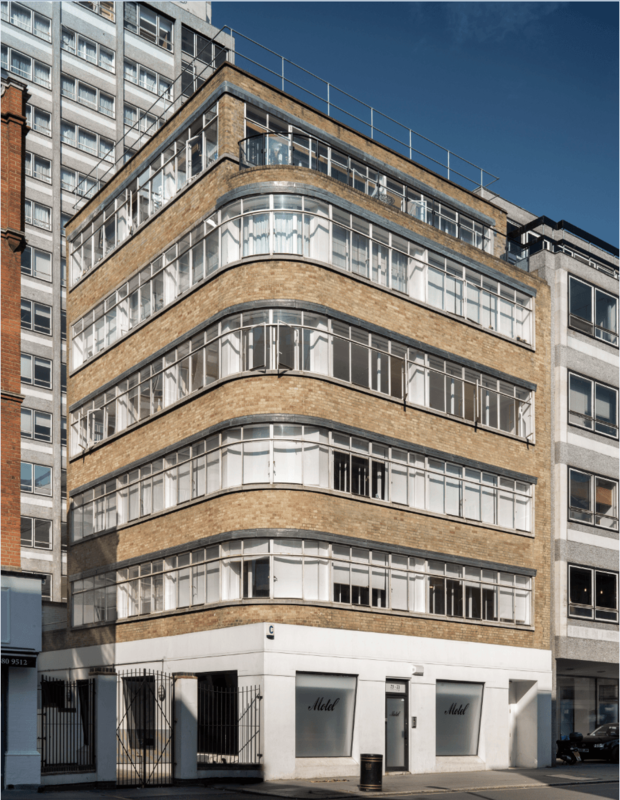 The architects Shaw & Lloyd worked up a radical proposal in 1947, with the synagogue turned across the axis from Great Portland Street to Hallam Street, set over social space and flanked by narrow courts, with a taller block at the back facing Hallam Street, presumably for letting. 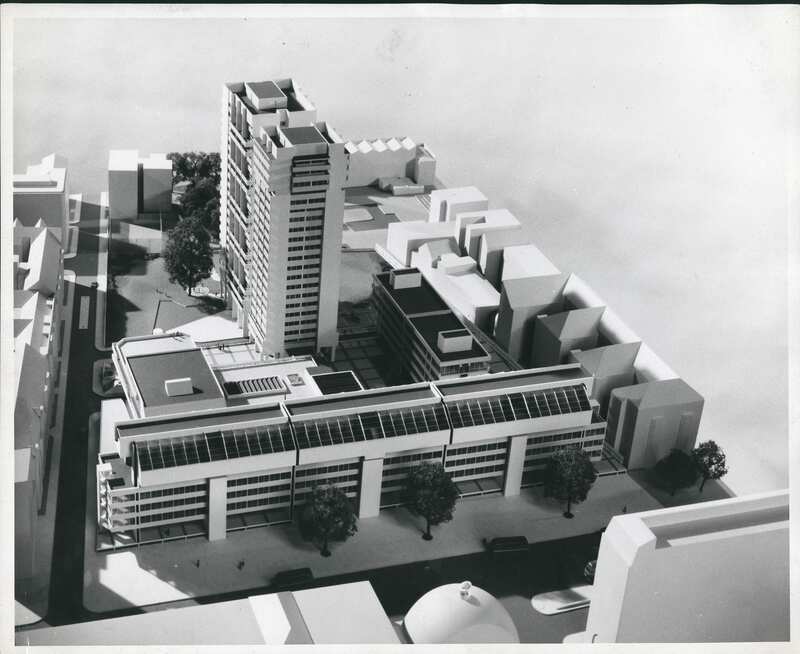 Having done all the war-damage costings and negotiations, in 1954 S. John Lloyd presented a fresh scheme for a 1,028-seater, to be built of reinforced concrete with a Portland stone front to Great Portland Street. Wilford had made a name with cinemas before the war. He had no known connection with the Jewish community, but may have worked for the Wolfsons’ company, Great Universal Stores. 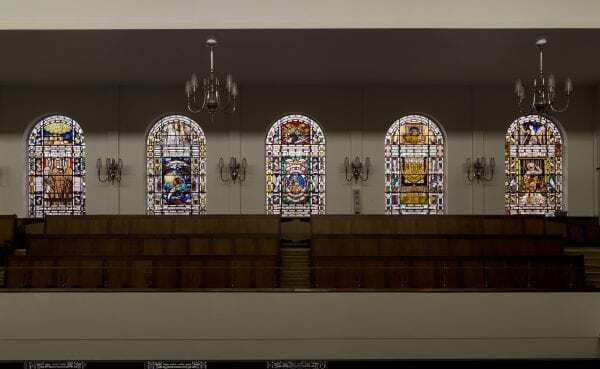 He and his assistants were directed to look at synagogues in London and perhaps also Venice. 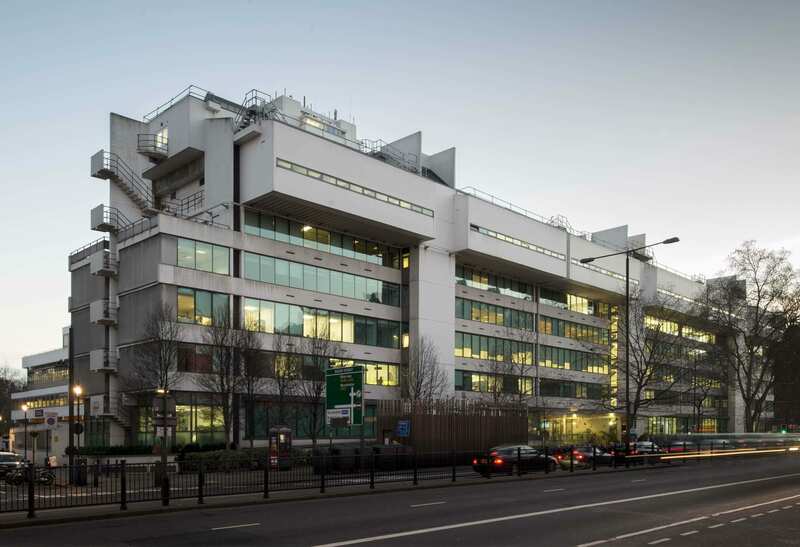 The result, built by Tersons Ltd in 1956–8, was a conventional, dignified building with close correspondences to its predecessor but an internal touch of cinematic glamour. The Great Portland Street façade is mainly clad in Portland stone, but the plinth and the columns flanking the high and hooded windows are of red Swedish granite. At the north end the entrance doors are set back in a high frame clad in gold mosaic. There is also a subsidiary entrance from Hallam Street. 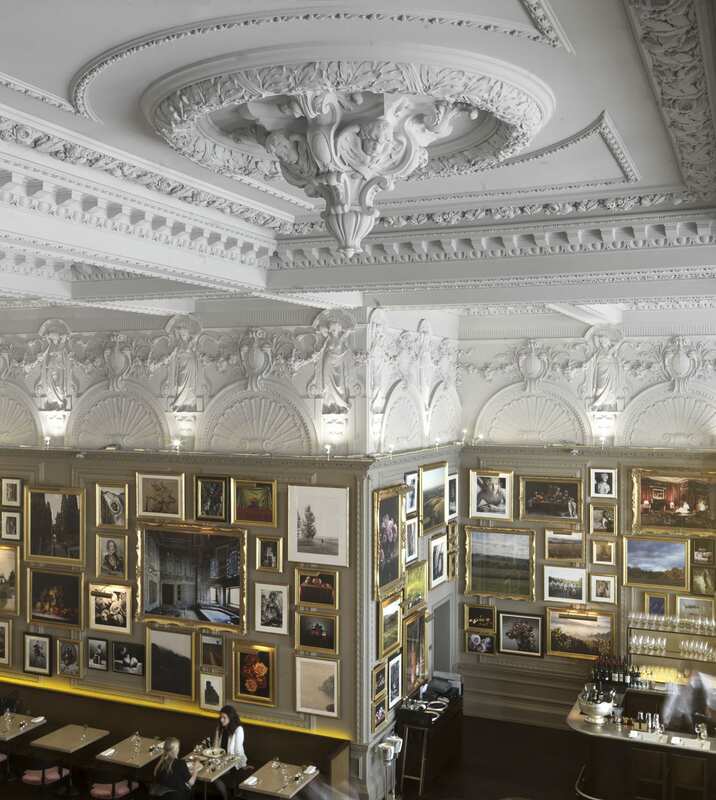 The galleried interior gives a powerful impression of height and restrained opulence. 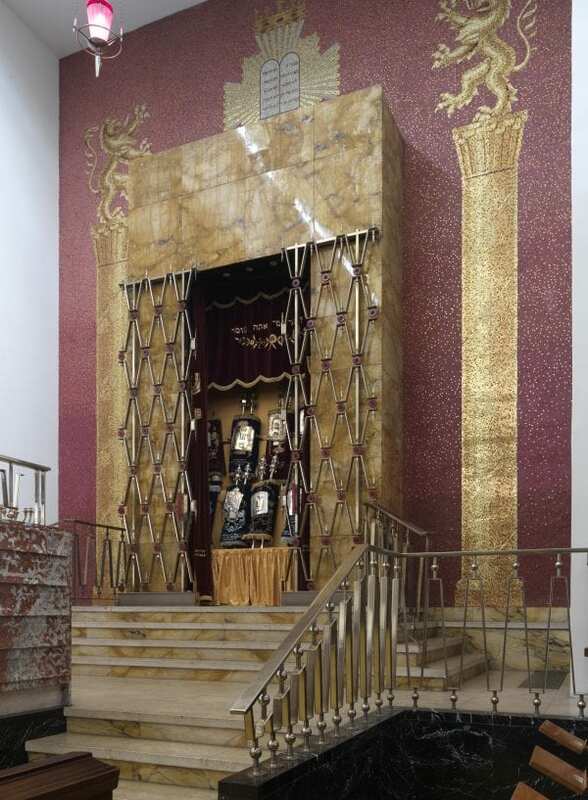 The focus is on the ark at the south end, which stands in an outer surround of red mosaic embellished by flanking lions on tall pillars of gold and an inner frame of Sienna marble. The bronze metalwork to the ark doors and elsewhere, made by the Brent Metal Company, is strong, spiky and characteristically 1950s. 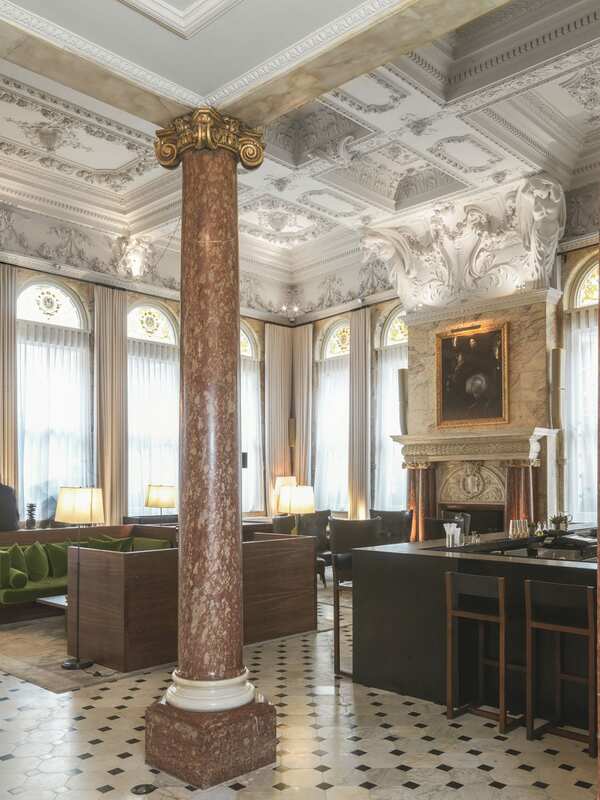 The other main feature is the almemar, clad in red marble, with attached panels carved in low relief. 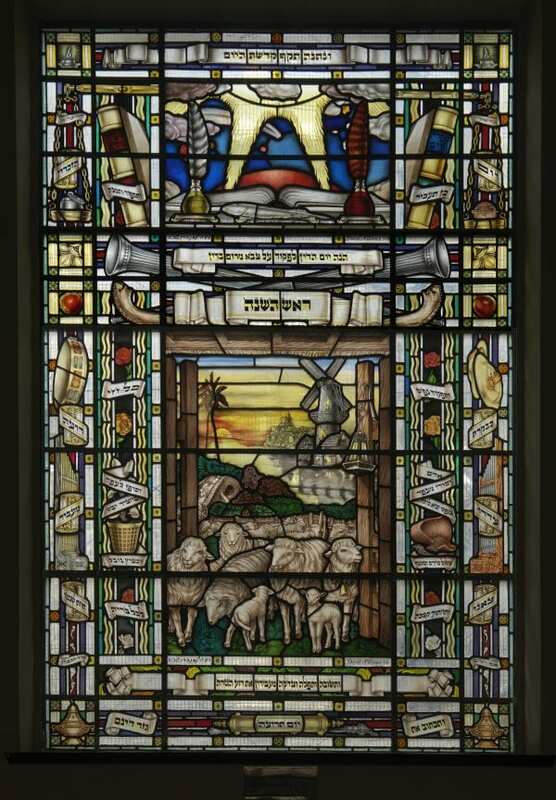 After completion, the synagogue windows were filled over a fifteen-year period with colourful glass made by Lowndes & Drury to designs by David Hillman. There is a hall below the worship area, and the circulation spaces including the stairs to the galleries are generous. 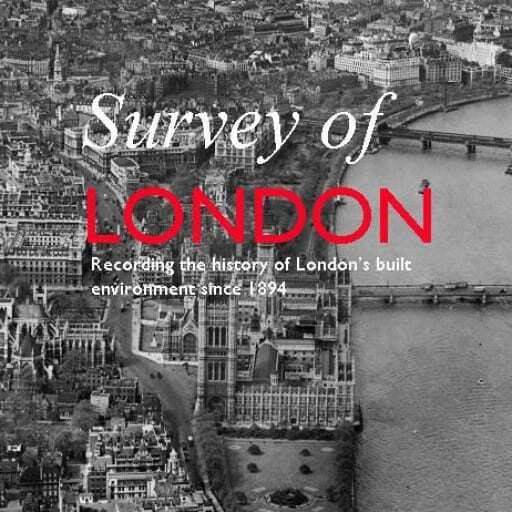 In 2017 the Survey of London will publish two volumes (Nos 51 and 52) covering a large swathe of the parish of St Marylebone, an area comprising much of the West End north of Oxford Street, otherwise bounded by Marylebone High Street and the Marylebone Road, west and north, and Cleveland Street and Tottenham Court Road to the east. 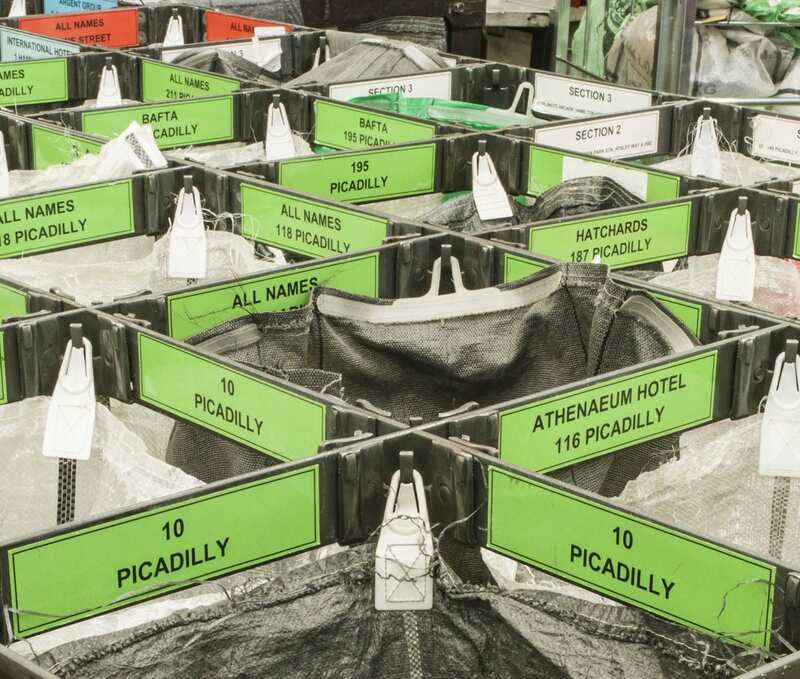 Like many of London’s place-names, Marylebone means different things to different people. To some it connotes the Marylebone Road and its penumbra, scarred by grinding traffic, to others the area adjacent to the two Marylebone Stations, main-line and underground, while those with a sense of civic history may call to mind a once-proud parish stretching from Oxford Street through St John’s Wood to the edge of Kilburn. By far the most famous association is with Lords, and the Marylebone Cricket Club founded in 1787. 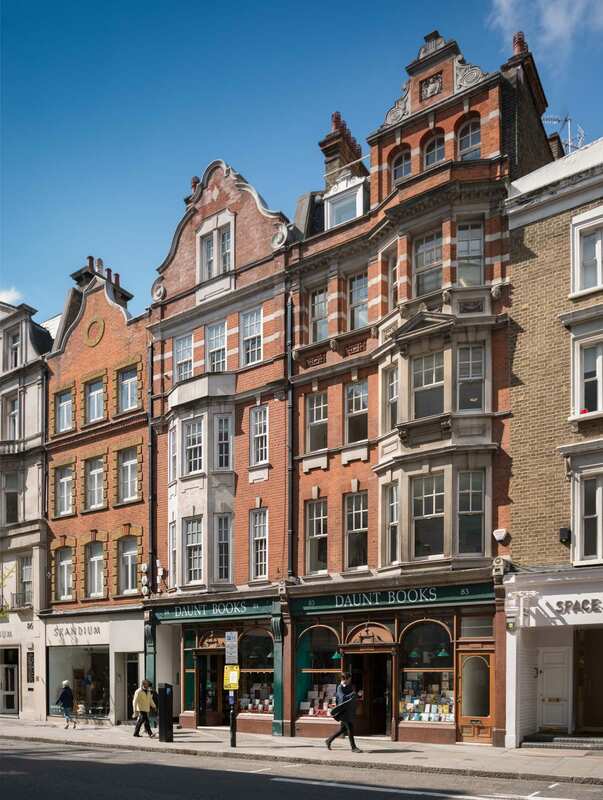 But the enduring image of Marylebone as a district is of the grid of alternating streets and mews, leavened by the occasional square, that picks up the West End’s uncertain structure beyond Oxford Street and shakes it into order and urbanity. The aura of south-east Marylebone is various. Time-honoured medical connections have bequeathed cosmopolitanism and gravity to the central grid. 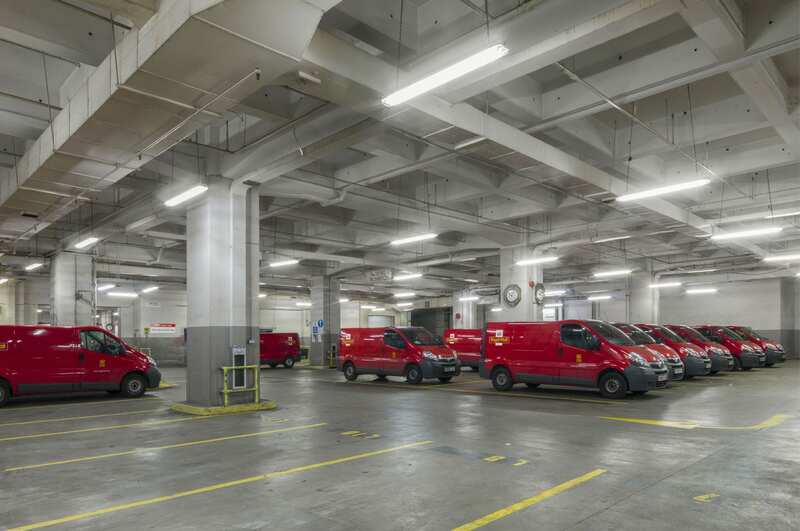 Here patients for private clinics or guests at serviced apartments and hotels alight at the kerbside, chauffeurs linger on the qui vive for parking attendants, and pedestrians scurry rather than saunter, pressed forward by the rhythm of the streets. 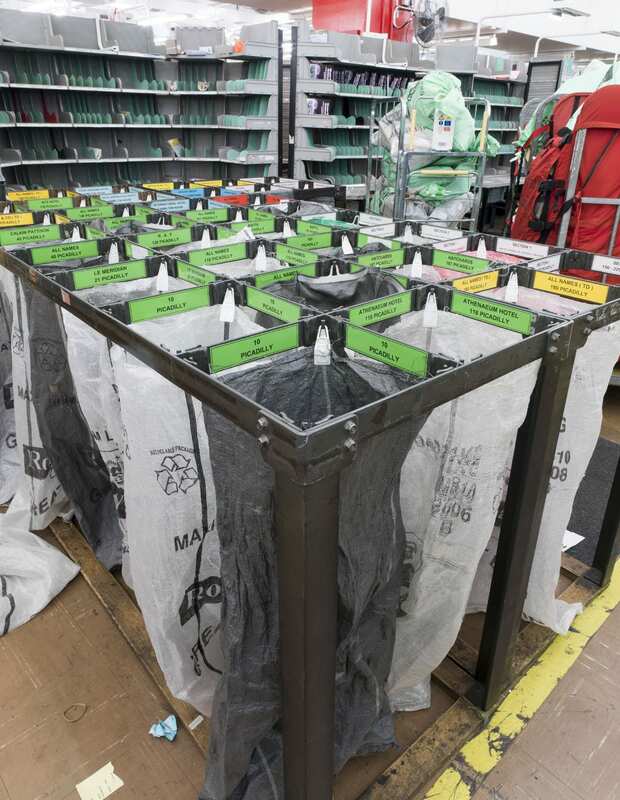 A mundane mews behind may be disrupted by a vision of nurses on tea-breaks clad in overall green, or a lorry backing in with oxygen canisters. Marylebone High Street and its boutiques draw their constituency of well-heeled shoppers and loafers. Yet Paddington Street Gardens and Marylebone Churchyard close by convey an air of ease, with old people reflective on benches or gaggles of schoolchildren on the grass. Lunchtime sprawlers in Cavendish Square are different – a mélange of shop assistants, office workers and tourists taking their breaks. On the fringes of Fitzrovia, the livelier portions of Great Titchfield Street and its surroundings exude conviviality, mixing pubs, small shops and cafés even now not all gentrified, patronized by the copious media businesses that have spread outwards from the BBC and taken over the premises of the dwindling garment trade. Parts of south-east Marylebone have resisted change during the last century. The following photographs taken by Bedford Lemere & Co. at the turn of the nineteenth century are shown alongside recent photographs by Chris Redgrave. 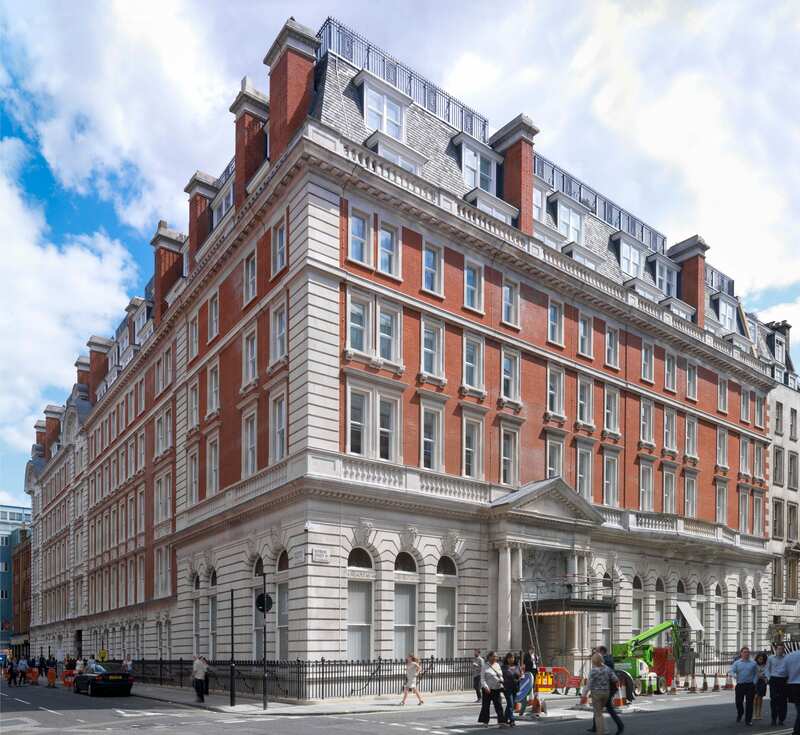 The south side of Wigmore Street offers a sudden change in scale and monumentality with the silvery bulk of No. 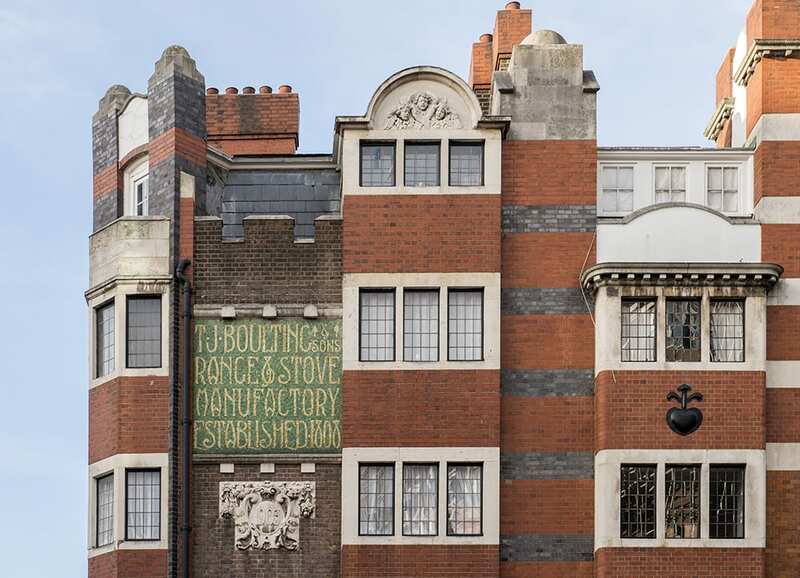 33, built as headquarters for the drapery business of Debenham & Freebody in 1906–7. 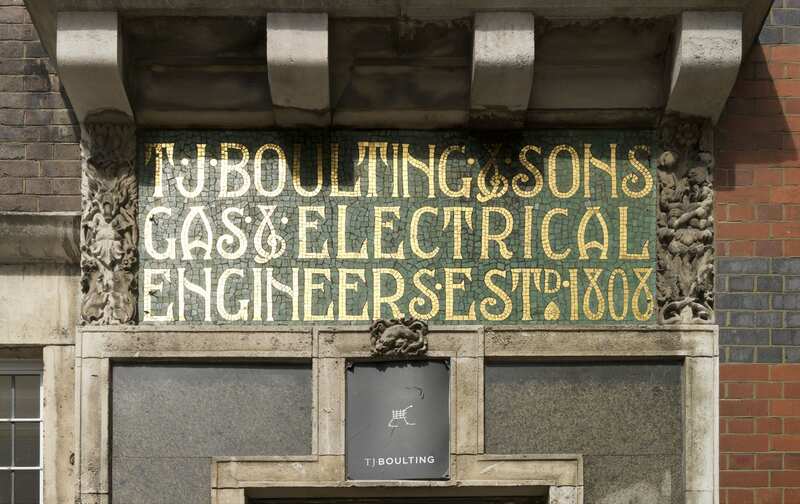 A public offer was made in 1907 to help pay for a grand reconstruction of the Wigmore Street premises, ‘rambling and incoherent’ after 90 years of piecemeal development. 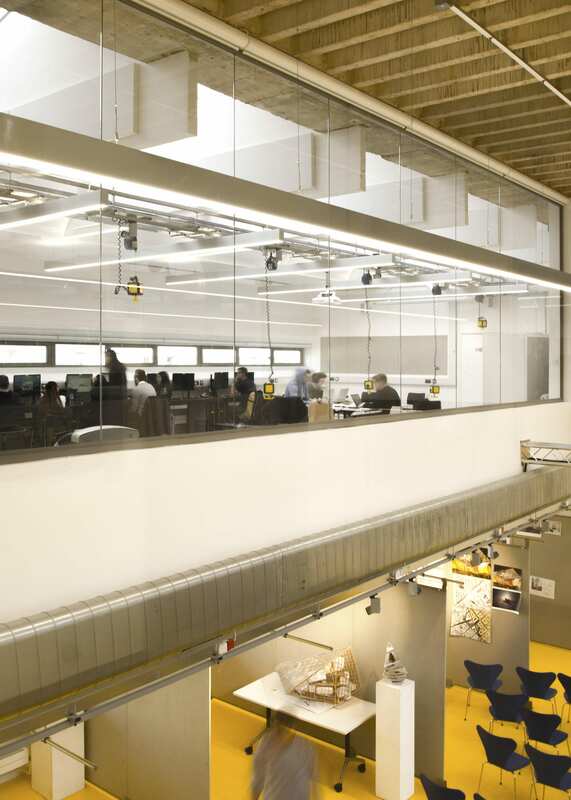 The London Scots architects William Wallace and James Glen Sivewright Gibson were chosen to design the new building. The frontage was conceived as symmetrical across the whole of the block, but because of the bank there is an extra bay at the west end, devoted originally to a discrete fur shop. 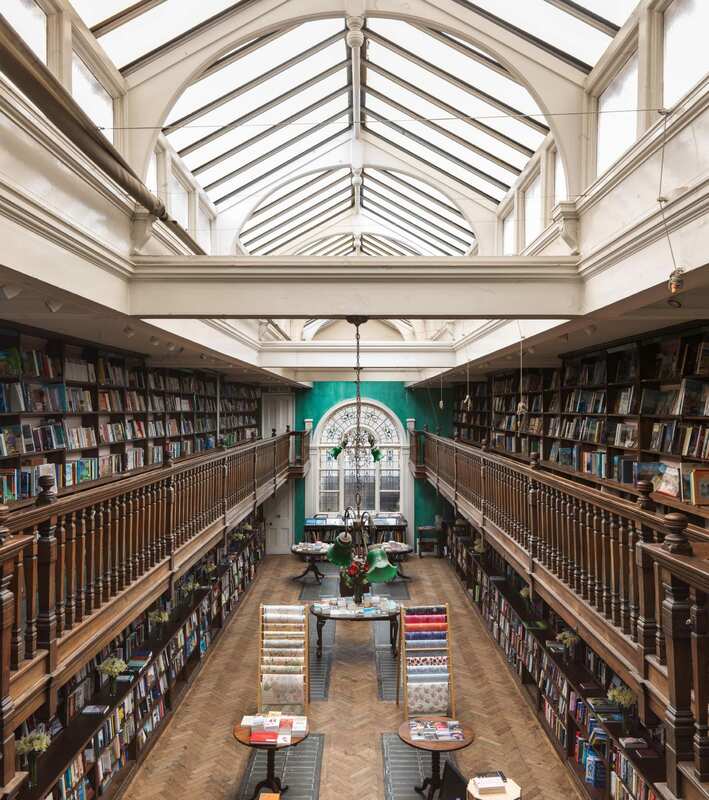 A giant arcade runs across the ground and first floor, with plate-glass windows to what were originally single large shops either side of the entrance, their semi-circular tops lighting the first-floor showrooms. Three segmental pediments top three bays set slightly forward with paired giant-order Corinthian columns of grey-green Truro marble forming a vestigial screen to the third and fourth floors. Decoration is mostly channelled ‘stone’ work to the first floor, applied garlands, and two seated female figures within the central pediment, all executed in Doulton’s Carrara Ware. Crowning all is a columned lantern-turret on an octagonal plinth. Nos 34–60 is the best run of surviving Adam-period houses in Portland Place, still with its eye-catching stuccoed and pedimented central pair at Nos 46 and 48, with their ingenious mirrored angled entrance doors. It is here that one gets the strongest sense of the Adam brothers’ original palace-front design concept. Various alterations have changed the appearance of the middle pair at Nos 46 and 48, marring though not completely obliterating the powerful original composition. Its crowning balustrade has gone but for once, when the upper floor was extended around 1870, rather than building up the front wall as elsewhere in the street, the builders left the central pediment in situ, with an enlarged mansard roof and dormers rising behind. Like its partner opposite (No. 37, now demolished), this façade was faced entirely in stucco and decorated with a frieze, pilasters, roundels and characteristic Adam panels of griffins and urns of the same material. Unusually the rusticated ground floor has the windows flanking the entrance set within relieving arches. Particularly elegant is the shared entrance within a shallow apse under a segmental arch, with the two doorways set at an angle. No. 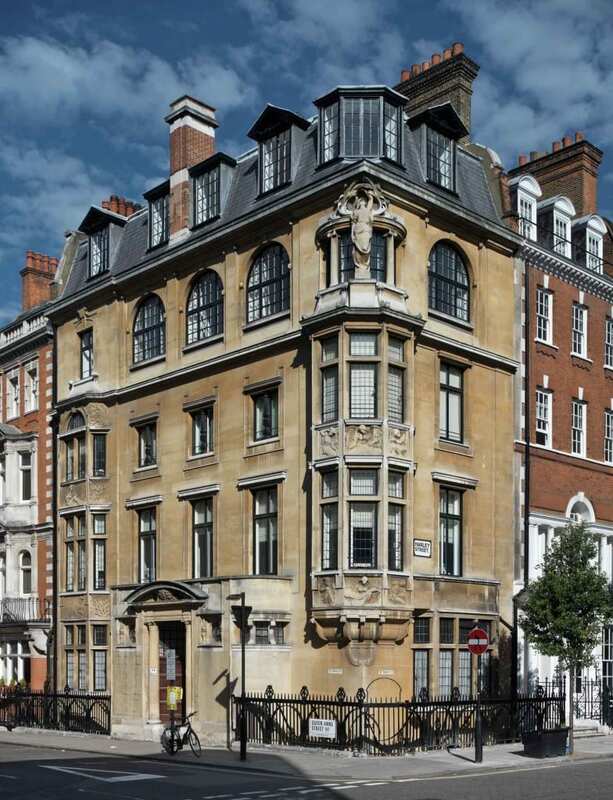 28 Portland Place retains its Adam pediment and Ionic pilasters (though both were raised in the nineteenth century to accommodate an extra storey), as well as a later Doric entrance porch. 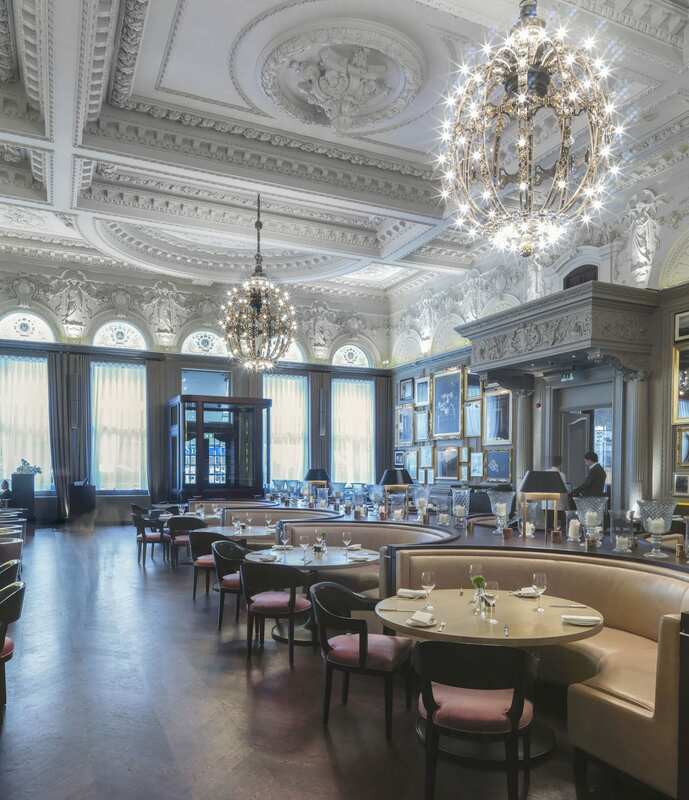 Despite many changes it still exudes an aura of old-world elegance. Though it was sold by the Goslings to the Institute of Hygiene in 1928 and has been in institutional or corporate use ever since, No. 28 is still a first-rate example of a London society townhouse adapted and added to over time by one family. The interiors have survived well, of which the most notable is an exceptionally fine ballroom, comprising a suite of linked first-floor drawing rooms fitted out in an elaborate late-Victorian Adam Revival style, with an abundance of painted and gilded plaster decorations and a figurative front-room chimneypiece in the manner of Wyatt. 9 and 11 Harley Street are tall red-brick rebuildings, of 1891 and 1886 respectively, in similar styles, with plentiful stone dressings and pediments. No. 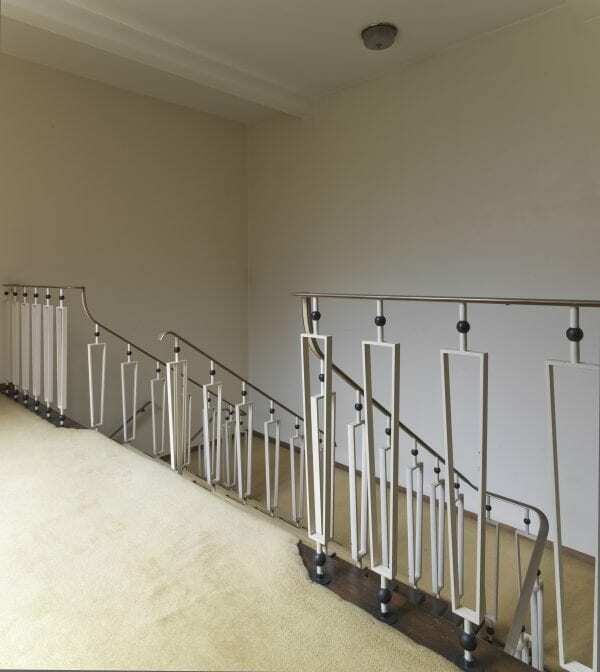 9 was designed by F. M. Elgood as a speculation for W. H. Warner (of Lofts and Warner, estate agents). Elgood was also involved in the design of No. 11, one of his earliest works in the area, whilst still in partnership with Alexander Payne (to whom he was articled) as Payne & Elgood. Their client was the physician and surgeon William Morrant Baker. The building was extended to the rear in 1906 for another doctor, the dermatologist J. M. H. McLeod. Stone figures on the gable were removed in 1937. 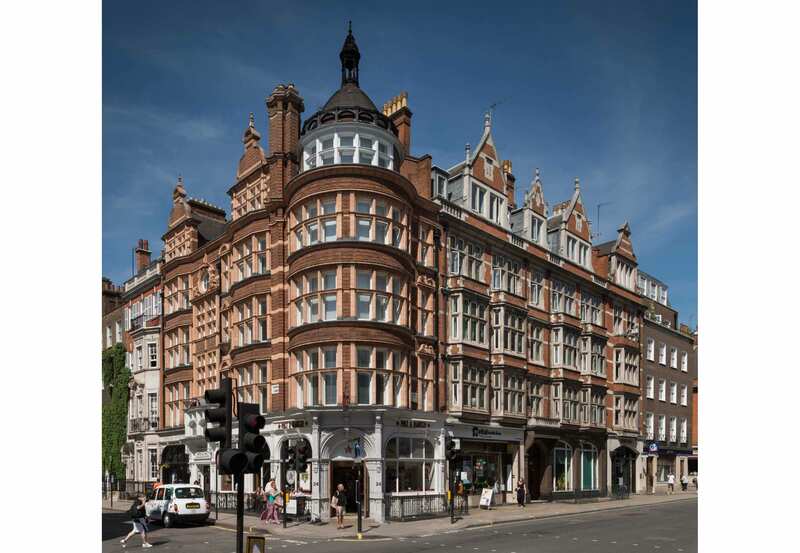 Nos 18–22 Wigmore Street were built by Holloway Brothers in 1892–3 to the designs of Leonard Hunt, as showrooms and offices for the piano manufacturer John Brinsmead & Sons. 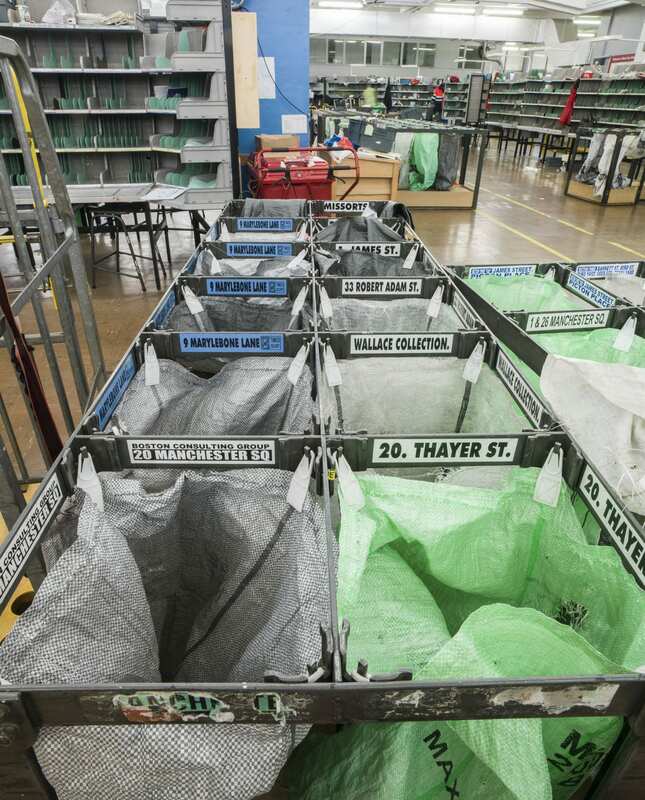 The business, founded in 1837, moved to No. 18 (then 4) in 1863 and subsequently expanded into 20 and 22. 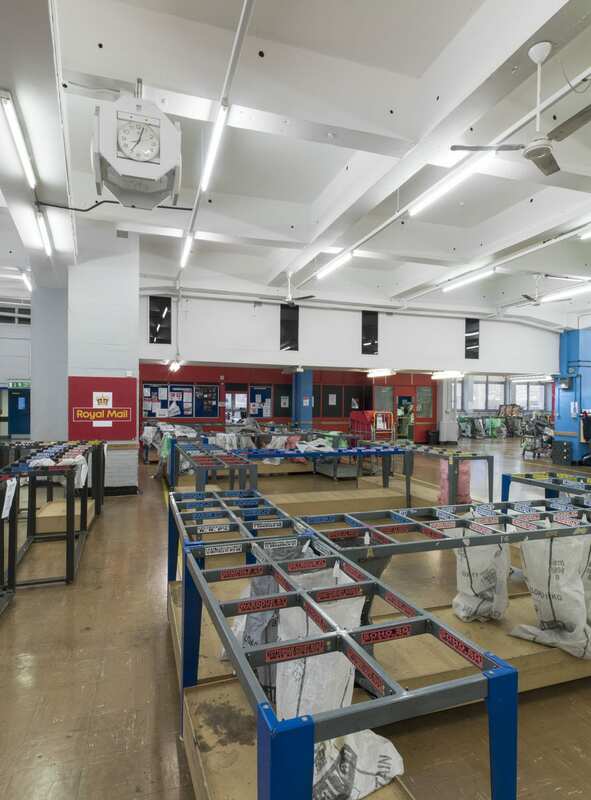 The works moved from Charlotte Street to Kentish Town in 1870, and by 1893 produced around 3,000 pianos a year. 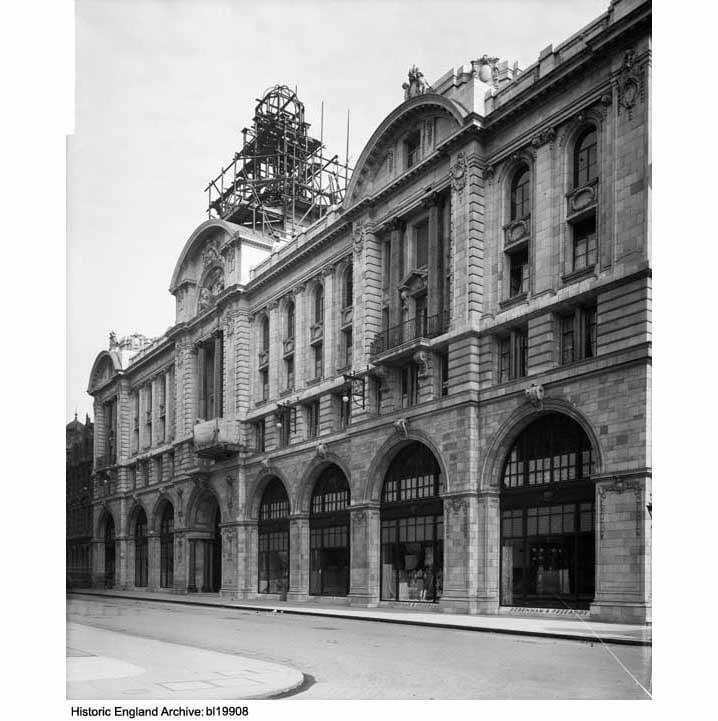 Hunt’s building, expensively finished with mahogany panelling and leaded glass, was ‘one of the sights of fashionable London’. 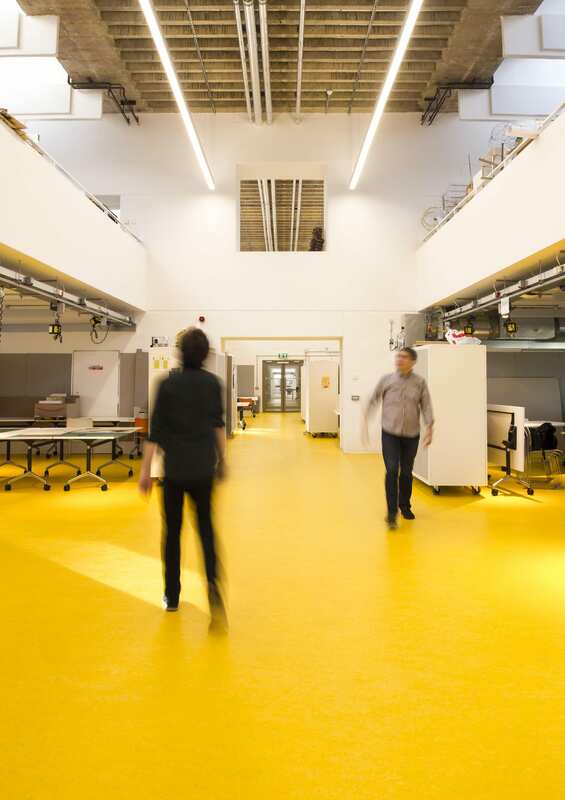 The ground floor was given over to display space, divided by a hallway with pavement lights illuminating basement showrooms, the upper floor comprising offices and chambers. 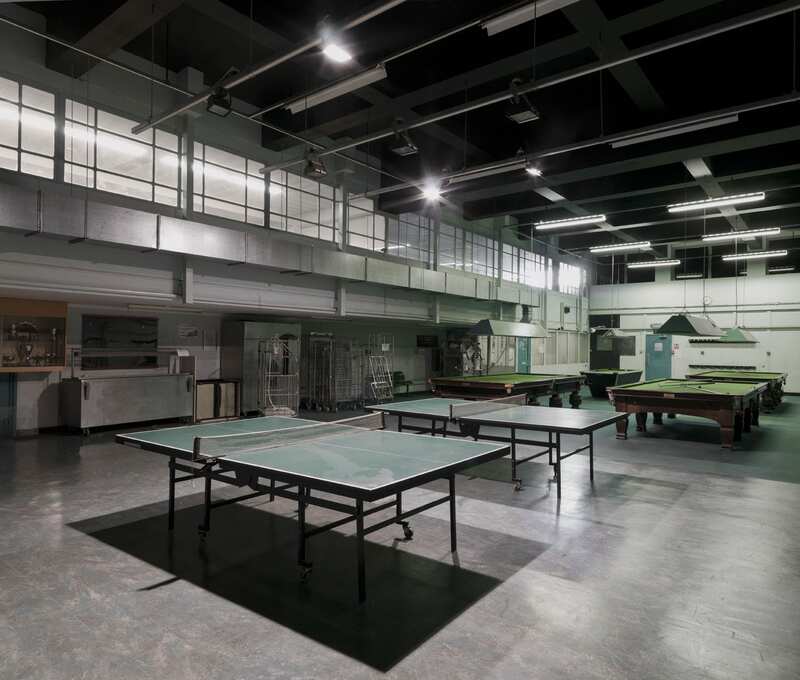 In 1895 a recital room was added at the back of the basement, seating 130. Lit from two sides with leaded windows, it had mirrored columns and fully-tiled walls. Bedford & Company, surveyors, had offices next door at No. 24. 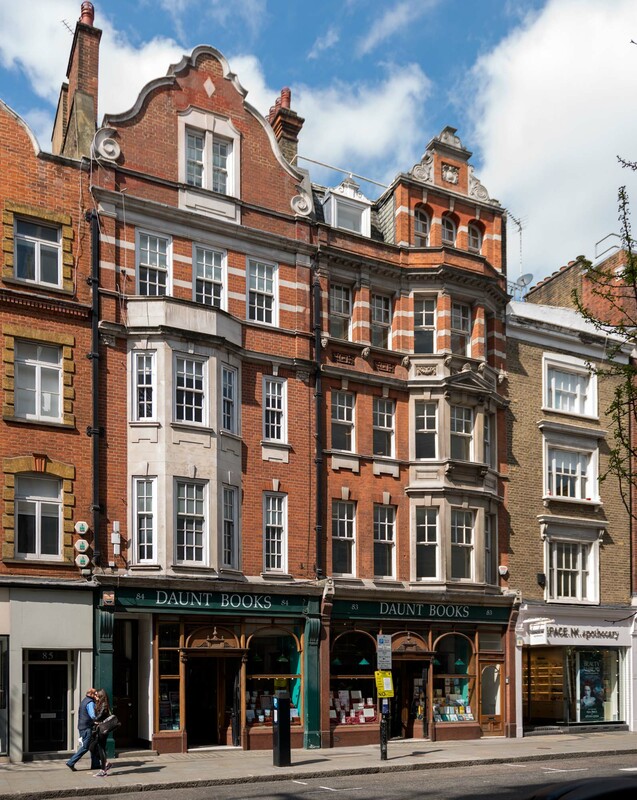 Brinsmeads went out of business in 1922, but was re-established at 17 Cavendish Square in 1924. 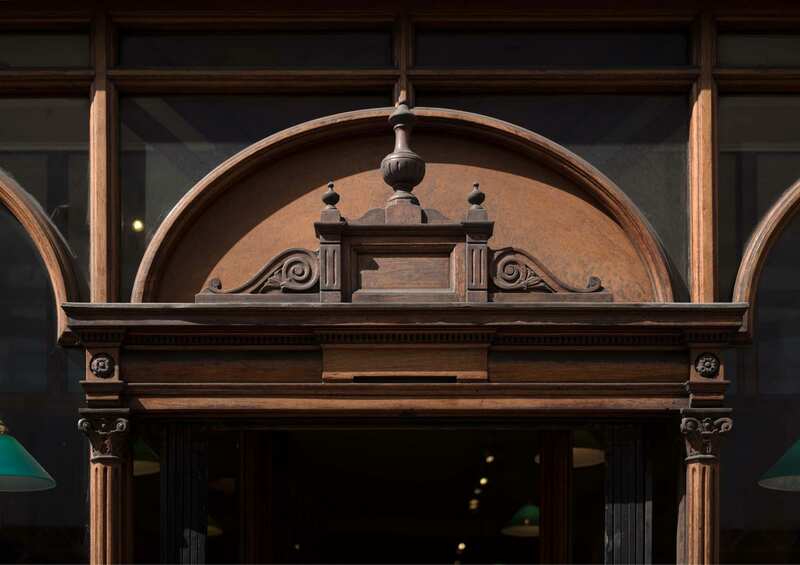 Lloyds Bank acquired the Wigmore Street building, creating a strong room within the former recital room, and subletting the western shop, which retains a 1928 neo-Georgian bronze shopfront fitted for the opticians Curry & Paxton. The upper floors were converted to flats in 1933. 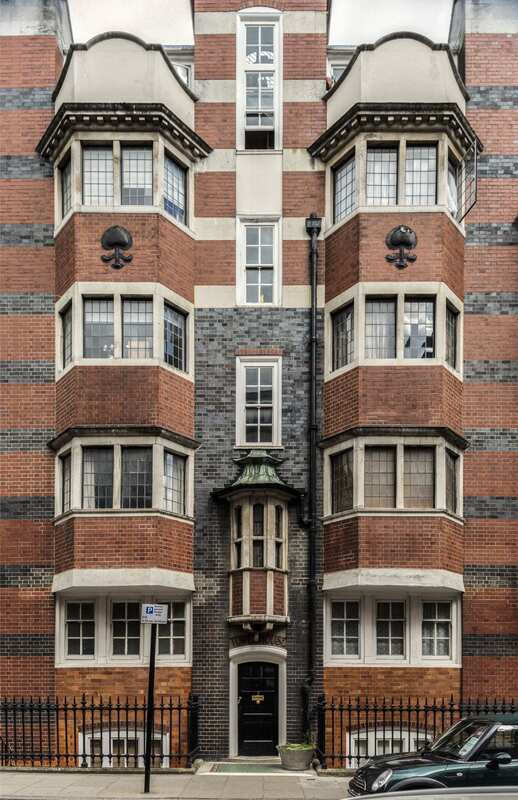 On the other side of Upper Wimpole Street, of 1908 in a strong, shaped-gable style, is 34 Weymouth Street, by F. M. Elgood for the developer W. H. Warner. 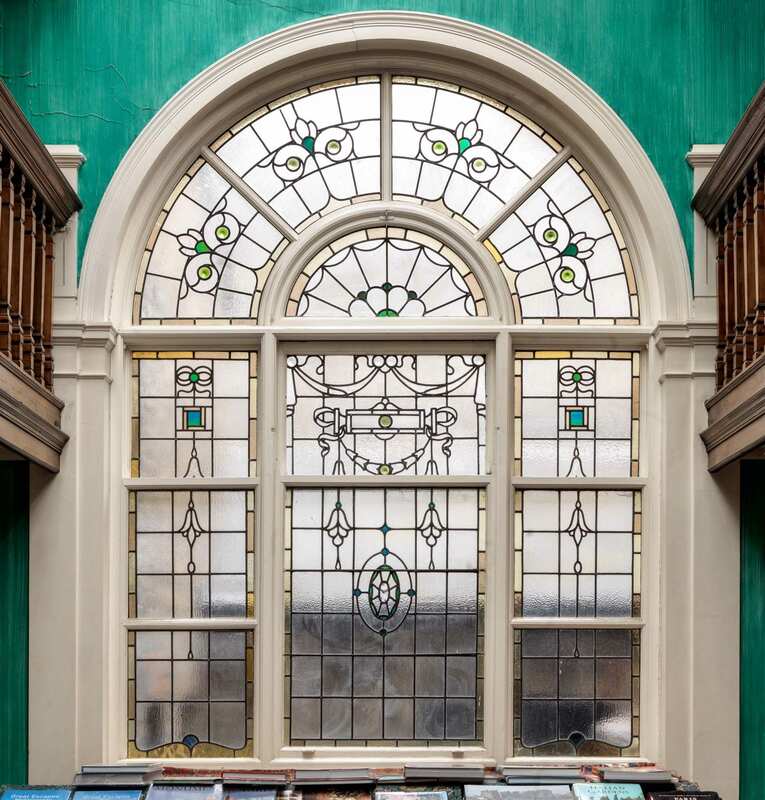 Here the gables have oculus windows with attractively sculpted stone surrounds and festoons beneath, the work of A. J. Thorpe, who was also responsible for the carved stone consoles to the door surround. 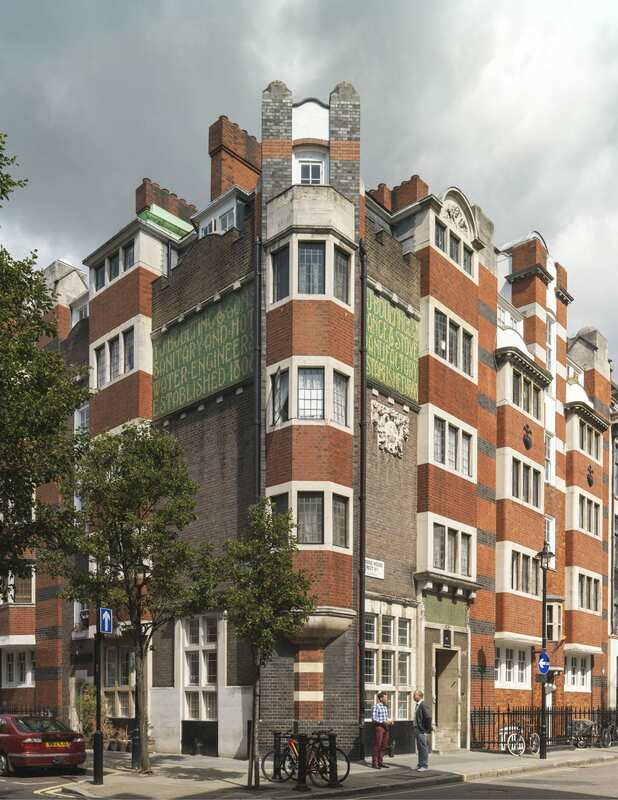 Though treated as one architectural piece, this large and imposing Portland stone corner block of 1910–12, extending round the corner into New Cavendish Street, appears to have been a joint redevelopment and was built as four separate ‘houses’, each originally comprising doctors’ consulting rooms on the lower floors and residential accommodation above. 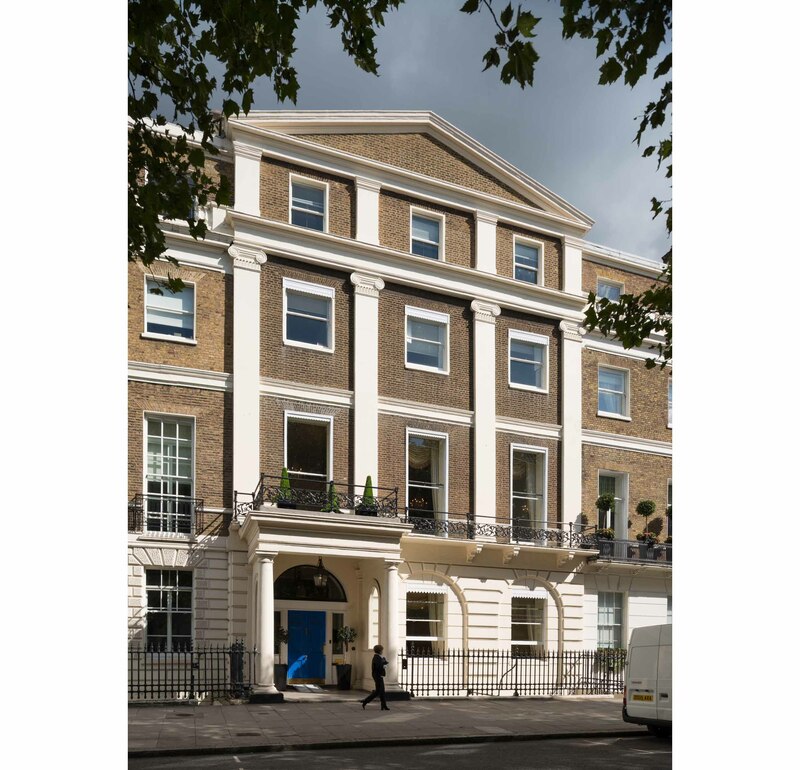 The two properties facing Wimpole Street (originally numbered 30 & 31) were designed by F. M. Elgood, working for the developer Samuel Lithgow. 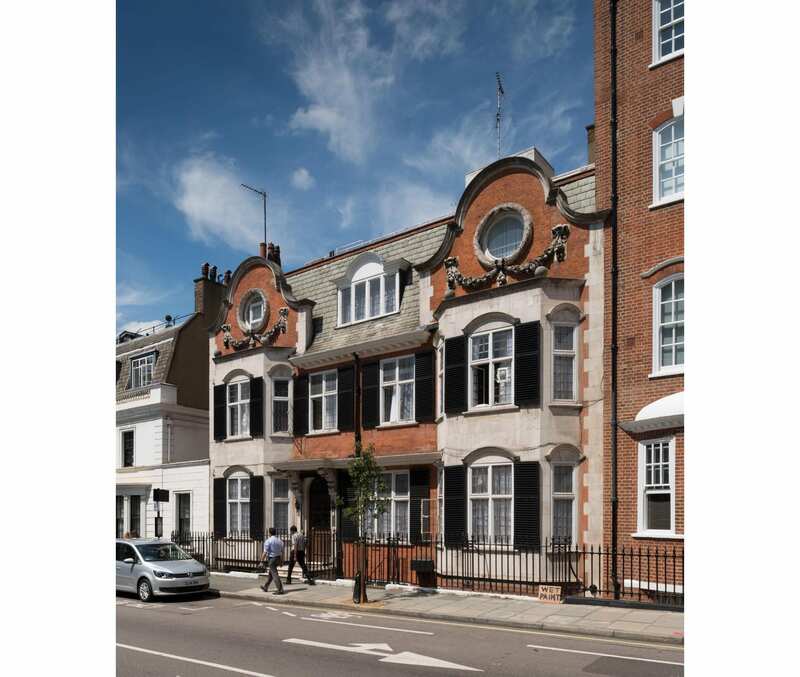 But the two houses fronting New Cavendish Street (30a & 30b) were by Banister Fletcher & Sons, acting for Dr James Lennox Irwin Moore, who had consulting rooms at 30a – and it was these two ‘doctors’ houses’ that attracted attention in the architectural press. The style is a muscular free Jacobethan, with mullioned and transomed windows, and a stone balcony resting on decoratively carved console brackets, all topped off by pedimented gables with deep modillion eaves – offering a strong contrast to Wimpole House opposite, with its dressing of florid salmon-pink terracotta. The composition is stylistically dissimilar to most of the Edwardian buildings on the Howard de Walden estate (and is none the worse for that) but there are a few oddities about the design. For instance, above the deep modillion cornice on the New Cavendish Street elevation, instead of gables as elsewhere, broad dormers flank a flat-roofed pavilion with a concave façade in what appears to be Bath stone but is probably coloured render. 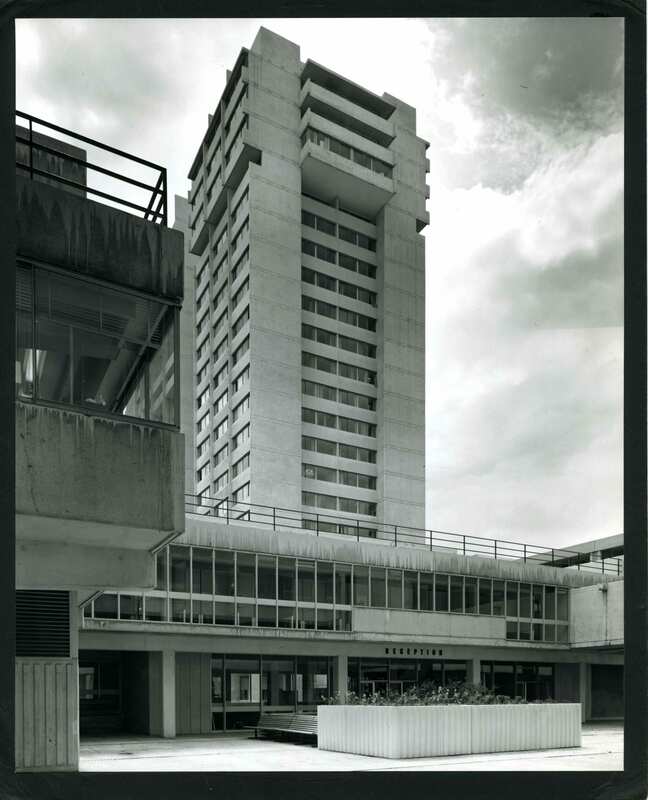 In terms of their construction, the buildings made use of expanded-steel reinforced concrete, with interiors awash with oak panelling and polished oak to the floors and staircases. 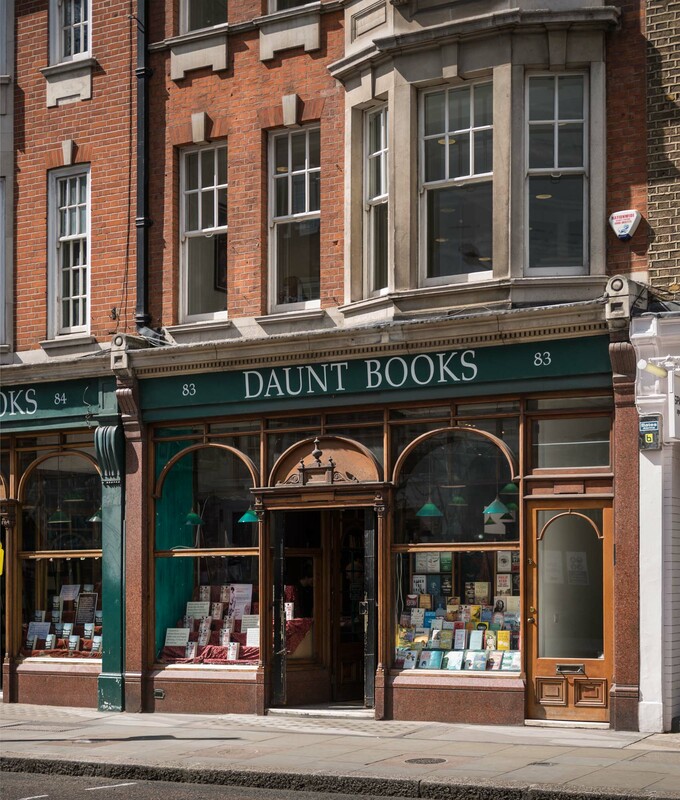 In advance of the publication of Volumes 51 and 52 of the Survey of London, on South-East Marylebone, in 2017, the draft chapters have been made freely available online. 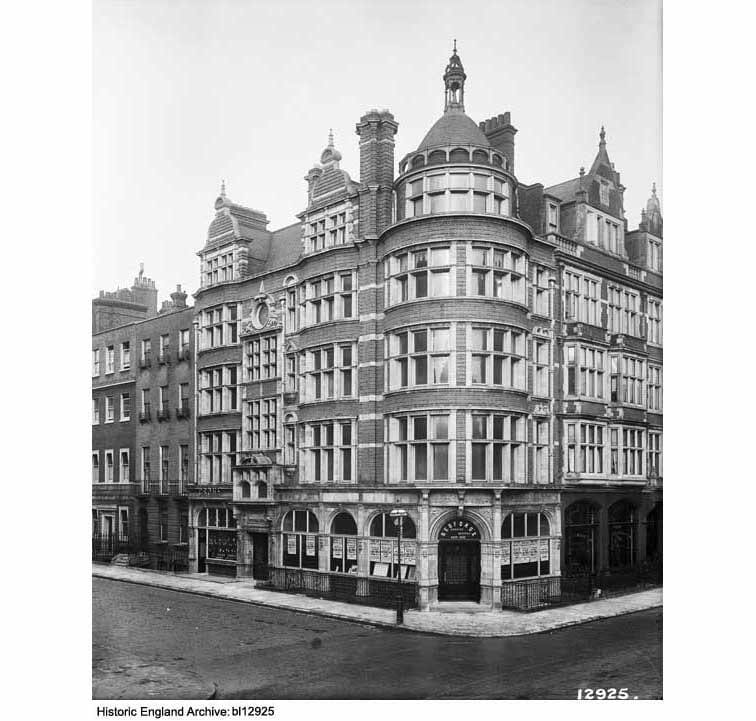 37 Harley Street, Marylebone (photographed by Chris Redgrave © Historic England). 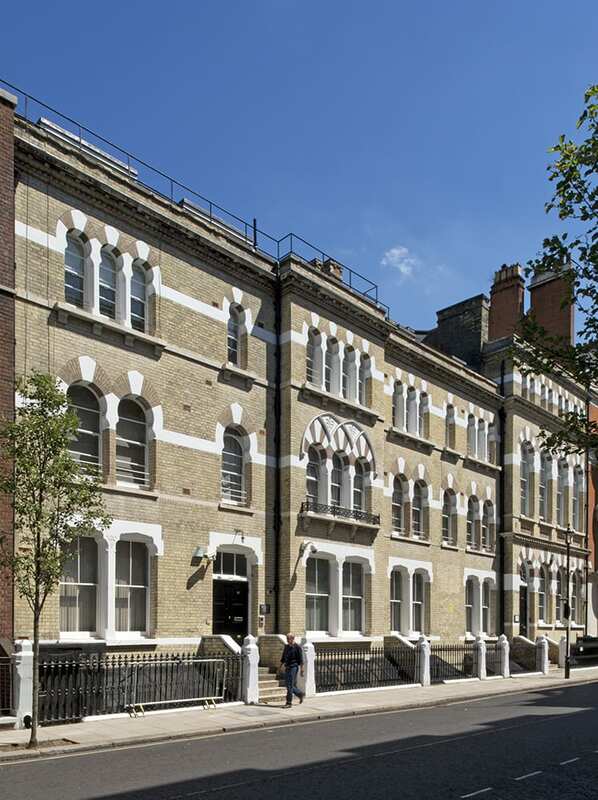 Perhaps one of the most widely admired late-nineteenth century buildings in South East Marylebone is 37 Harley Street, built in 1897-9 to designs by Arthur Beresford Pite. 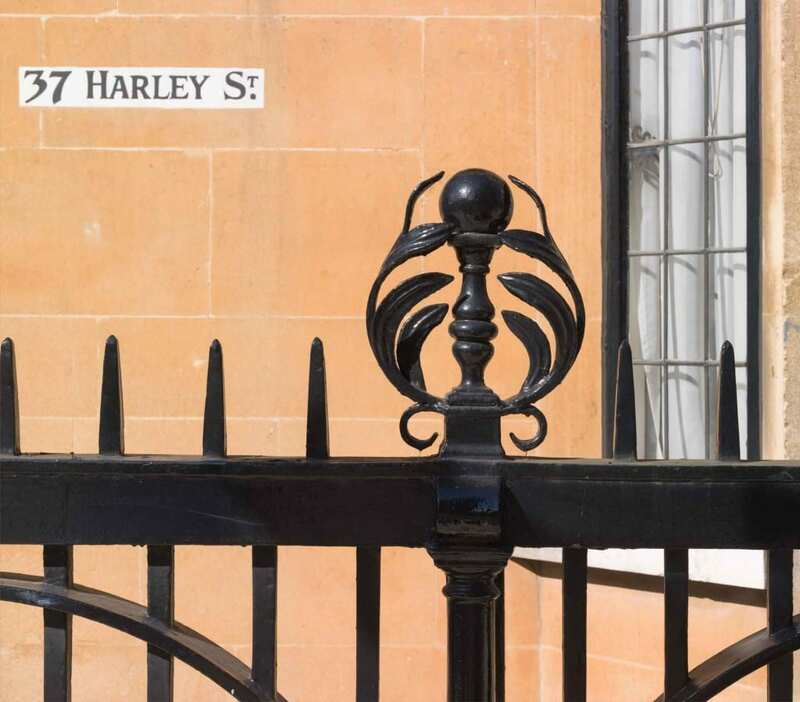 It is remarkably different from the houses and flats around it, and when newly built the architectural press proclaimed it to be ‘nothing short of a revolution in Harley Street architecture’. 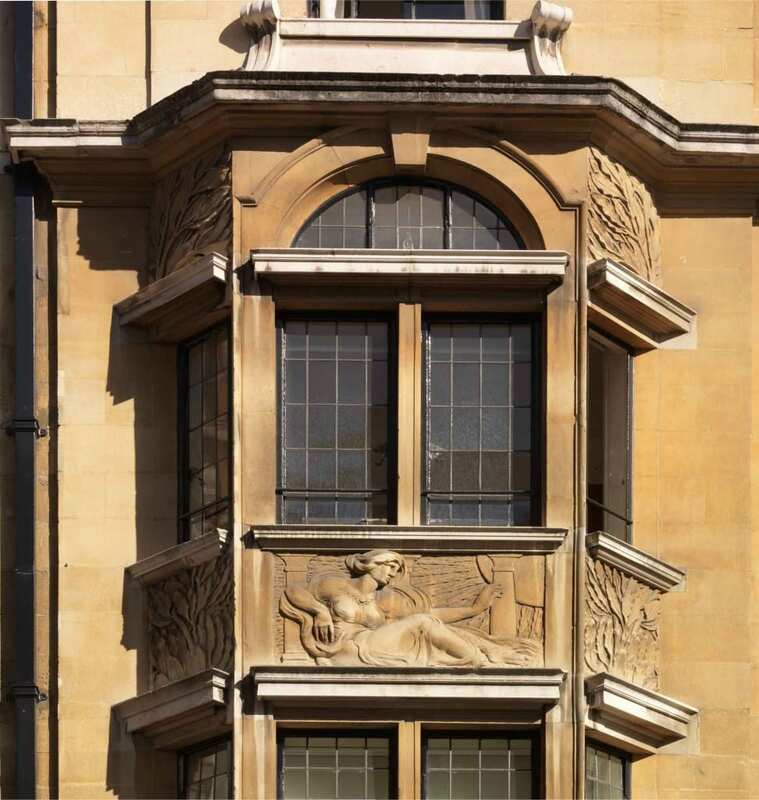 37 Harley Street, Marylebone, detail of oriel window (photographed by Chris Redgrave © Historic England). 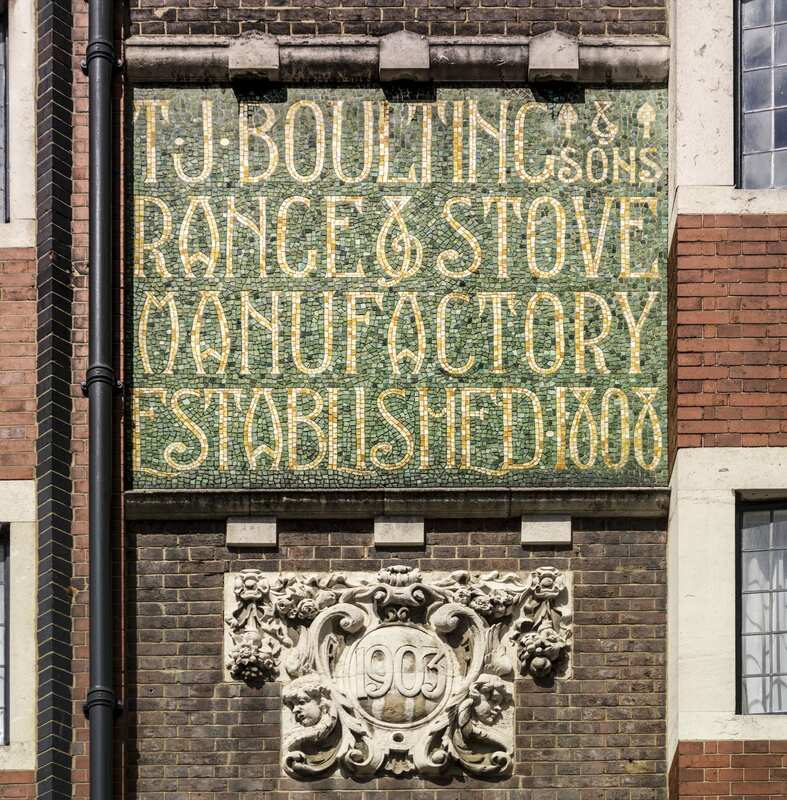 Marylebone was once the heartland of Beresford Pite’s London buildings, and his office was just around the corner at No.48 where he added turquoise mosaic tiles to the ground-floor front. 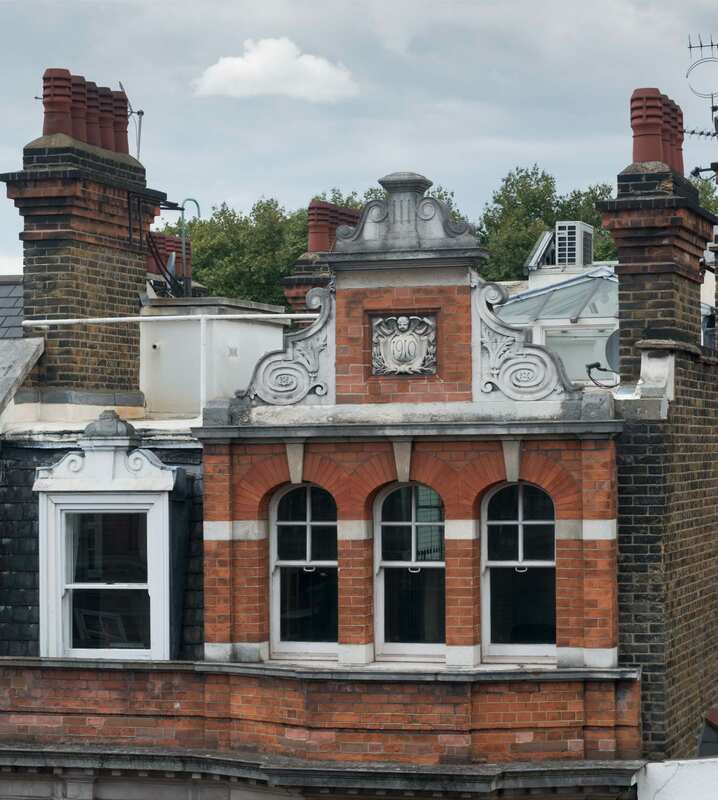 Many of his Marylebone buildings have gone, although his earlier 82 Mortimer Street survives, with its still arresting sculptural window treatment. 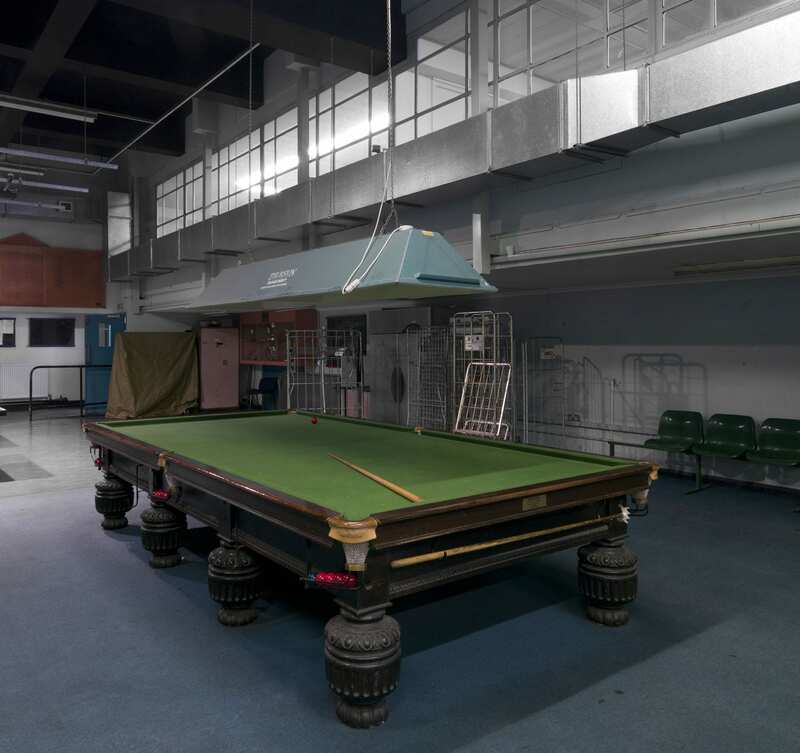 At both houses Pite was working with a local building firm, Matthews Brothers. 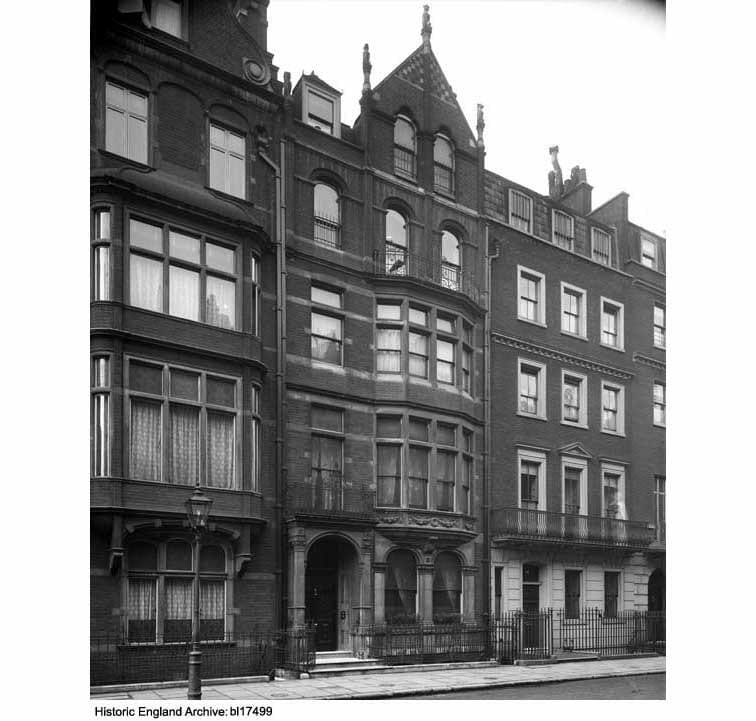 But while the Mortimer Street house was built with a specific client in mind, the anaesthetist Dudley Buxton, this one in Harley Street was a speculation. This was a boom time for medicine in the area, when houses were being snapped up by physicians and surgeons as homes with consulting rooms, and so it was designed with that end in mind. 37 Harley Street, Marylebone, detail of bay window (photographed by Chris Redgrave © Historic England). 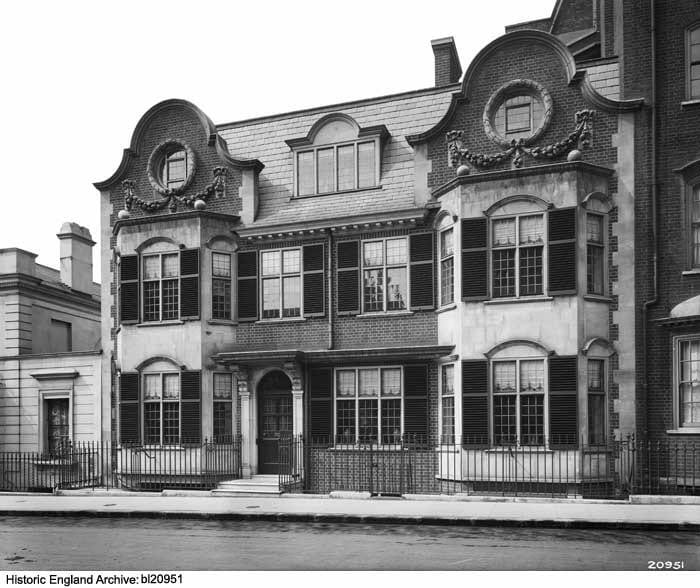 The Georgian house that formerly stood at this corner was narrow and relatively small, without back yard or mews. 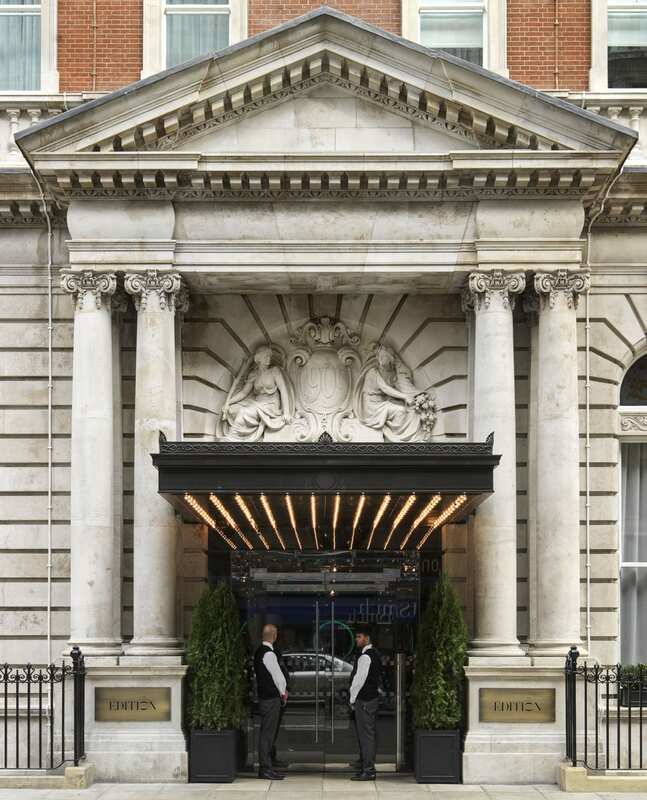 By shifting the main entrance from Harley to Queen Anne Street (without altering the address) Pite created a more open and versatile layout within. But the real charm of the building is on the outside, in the use of warm Bath stone, a rarity hereabouts, and the harmonious integration of the architectural sculpture that adorns it. It is not bold and thrusting, as in the Mortimer Street figures, but sinuous and restrained. 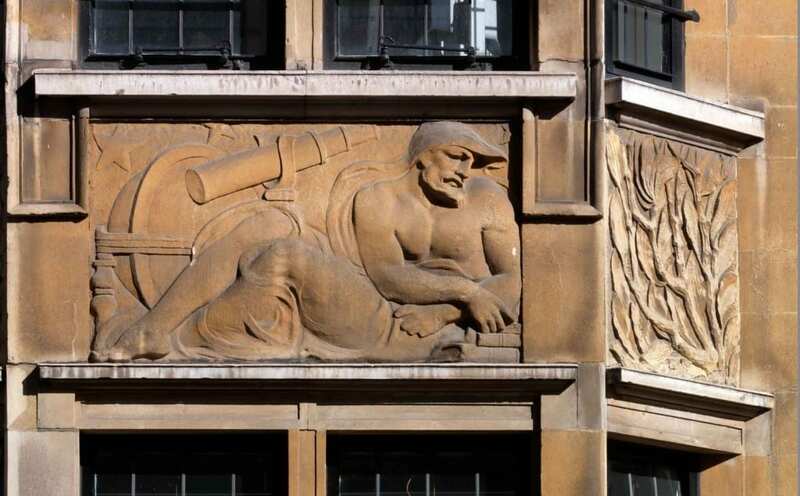 37 Harley Street, Marylebone, detail of bas-relief panel by Schenck depicting anatomy (photographed by Chris Redgrave © Historic England). 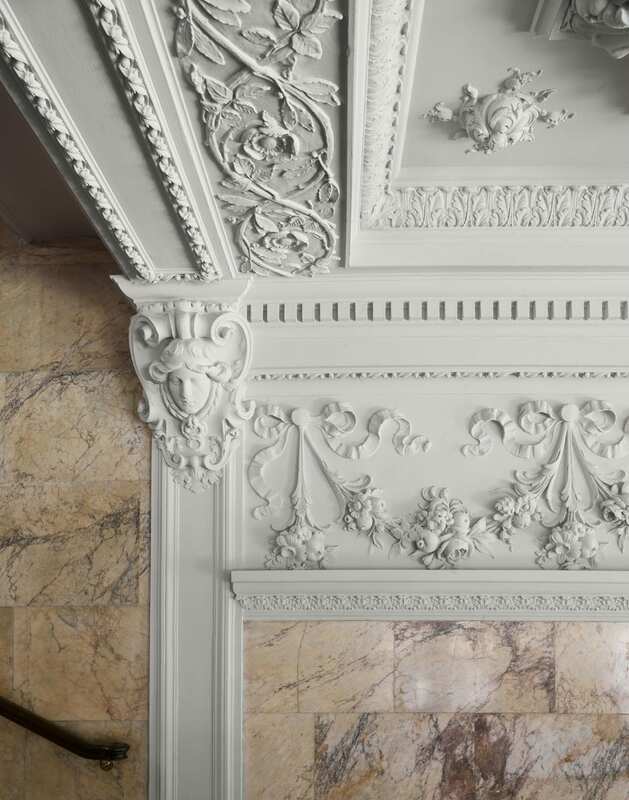 The success of the sculptural element can be ascribed at least in part to the close collaboration between architect and carver. The many bas-relief panels of allegorical figures are the work of the architectural sculptor Frederick E. E. Schenck. Low-relief friezes on the bay windows are arranged with figurative subjects, flanked by flowing branches and leaves, representing Grammar, Astronomy, Justice and Philosophy, with Poetry represented by Homer. 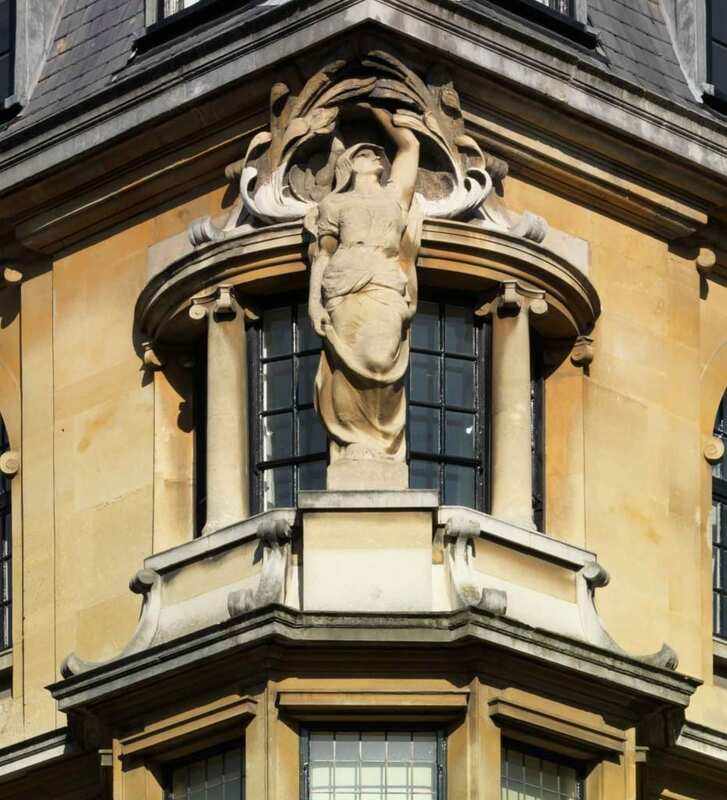 A dramatic winged figure atop the oriel symbolises Fame. 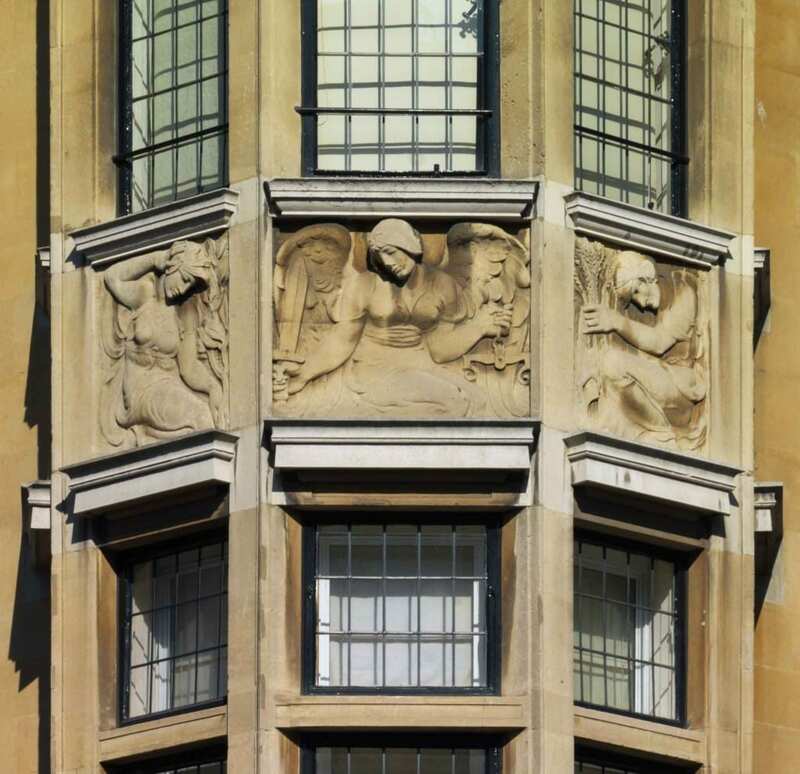 37 Harley Street, Marylebone, detail of Schenck panels on the oriel window (photographed by Chris Redgrave © Historic England). 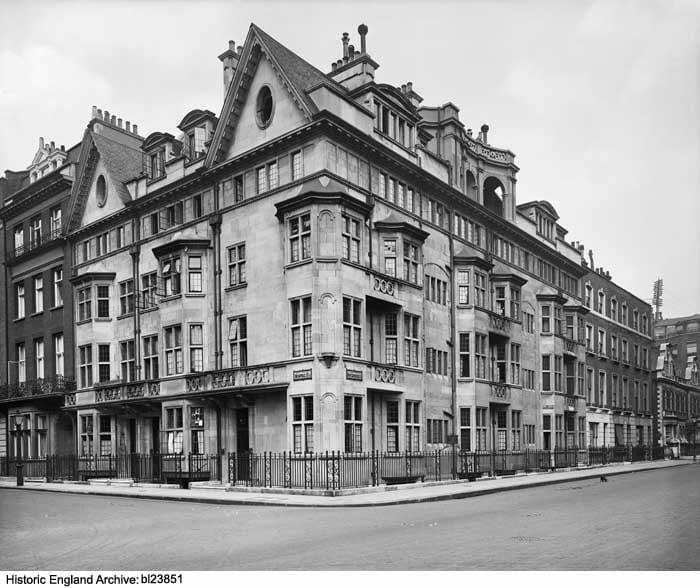 The first occupants in 1901 were (Sir) Edward E. Cooper, an underwriter (later deputy chairman) at Lloyds, talented amateur singer, chairman of the Royal Academy of Music and future Lord Mayor, and his wife (Lady) Leonora. 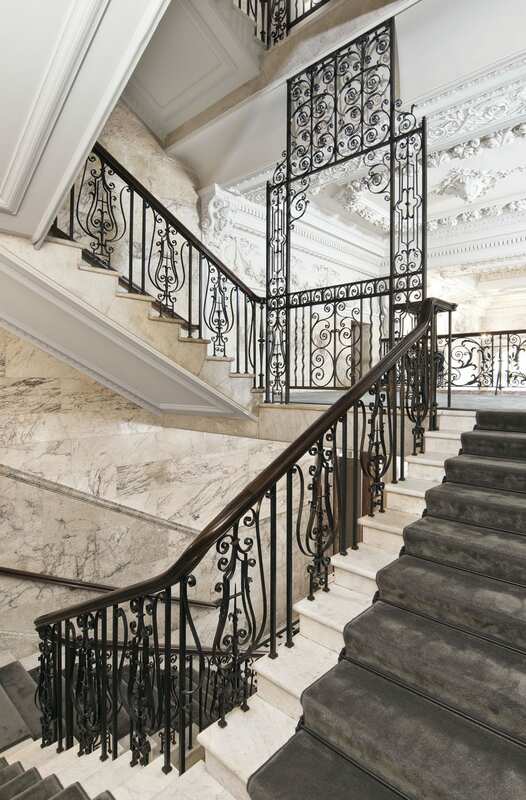 37 Harley Street, Marylebone, detail of the iron railings (photographed by Chris Redgrave © Historic England). The Coopers later moved out to Hampshire and by 1905 the surgeons Edred Moss Corner and (Sir) Percy William George Sargent were both practising and resident here; Corner’s son, the botanist Edred John Henry Corner (d. 1966) was born at No. 37 in January 1906. Other medical men associated with the building included the surgeons Sir Henry John Gauvain and Sir James Cantlie, both in the 1920s. 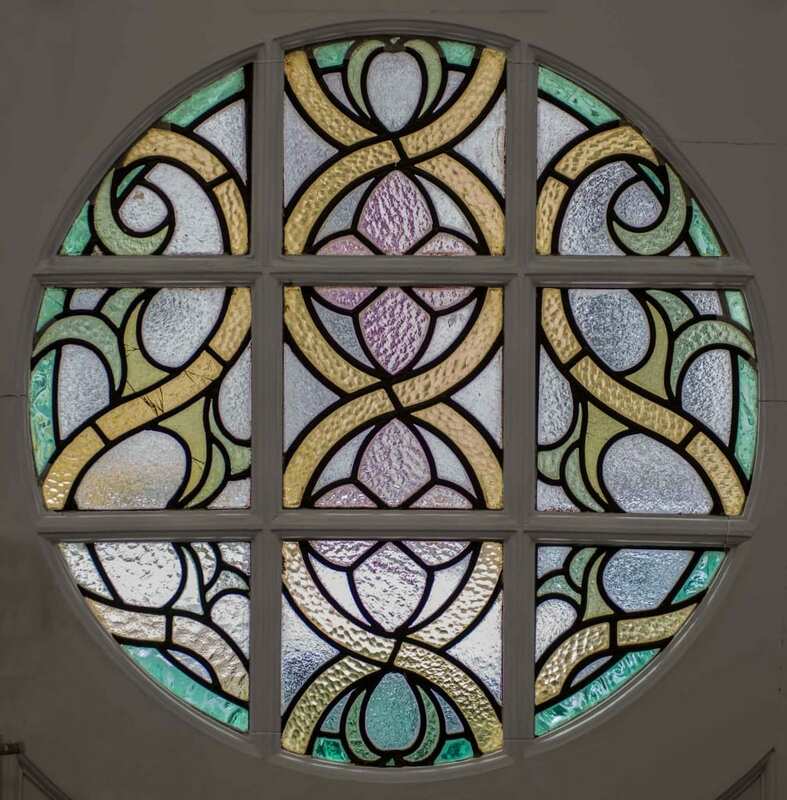 37 Harley Street, Marylebone, detail of coloured glass in the circular window in the door (photographed by Chris Redgrave © Historic England). 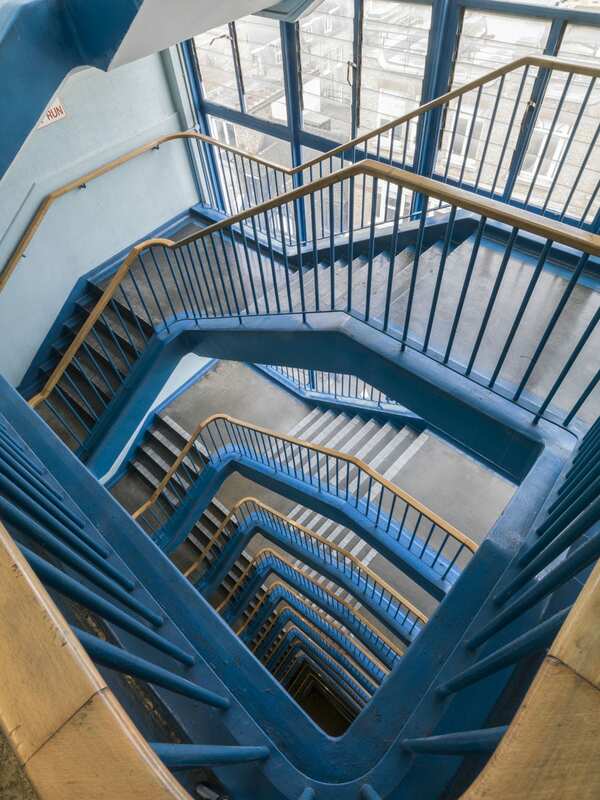 Though now subdivided and in mixed residential and office use, the building retains much of its original character. 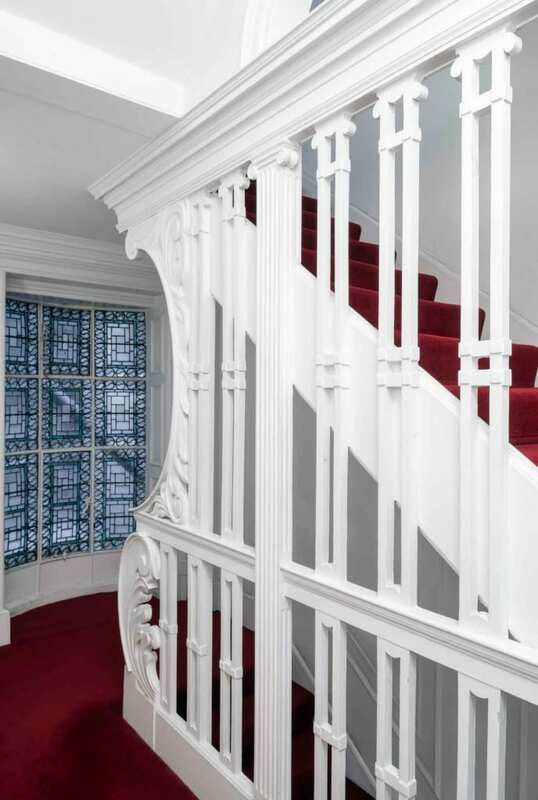 37 Harley Street, Marylebone, first-floor landing with Pite-designed stair balustrade and coloured glass in landing window (photographed by Chris Redgrave © Historic England). Text taken largely from the draft chapter from the forthcoming South East Marylebone volumes, which can be found online here.